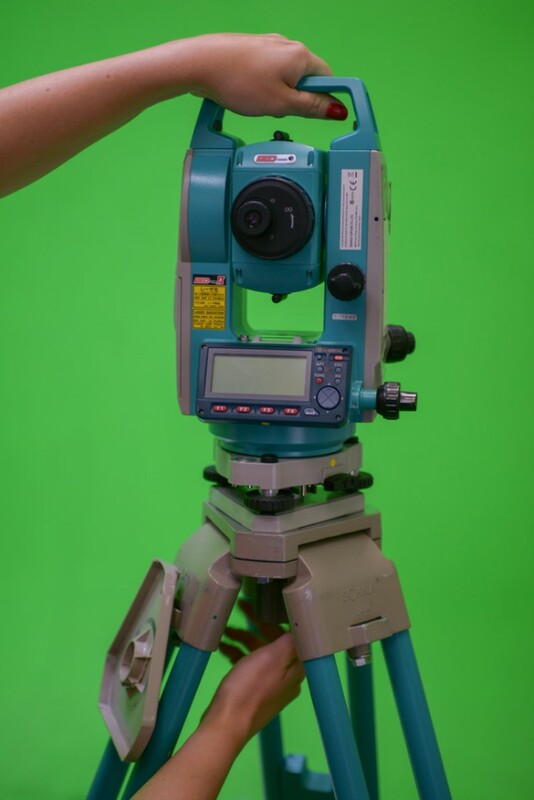 The surveying process is a procedural one and, by following these instructions, you should be able to survey an entire stage from beginning to end. 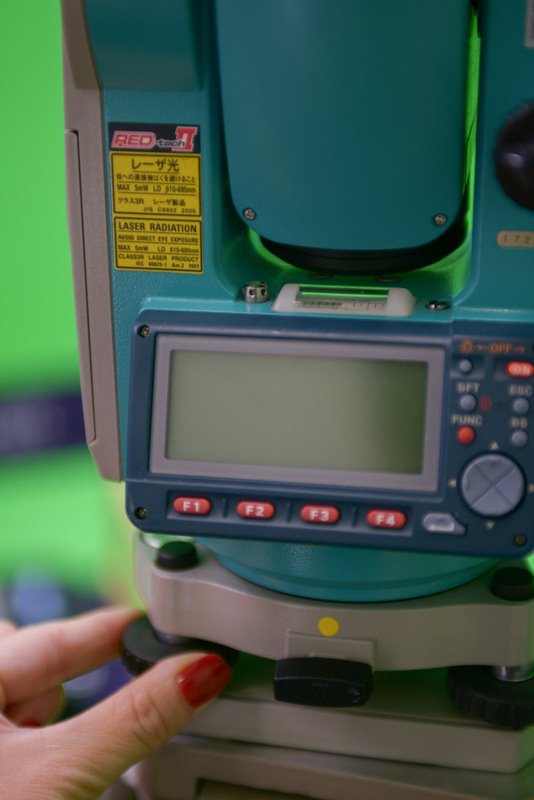 The survey process can take anywhere between 1-5 hours depending on the size of the stage and visibility of targets. 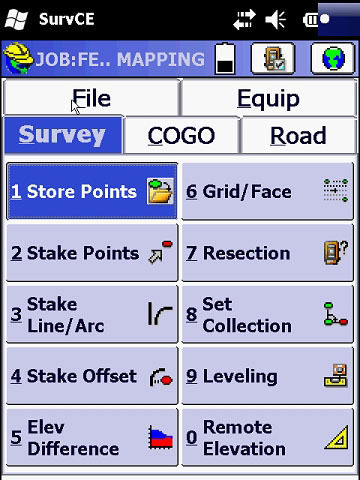 Stages with wires and lights in the way of the targets will take longer because you will need to move the survey instrument to multiple locations to capture all points. 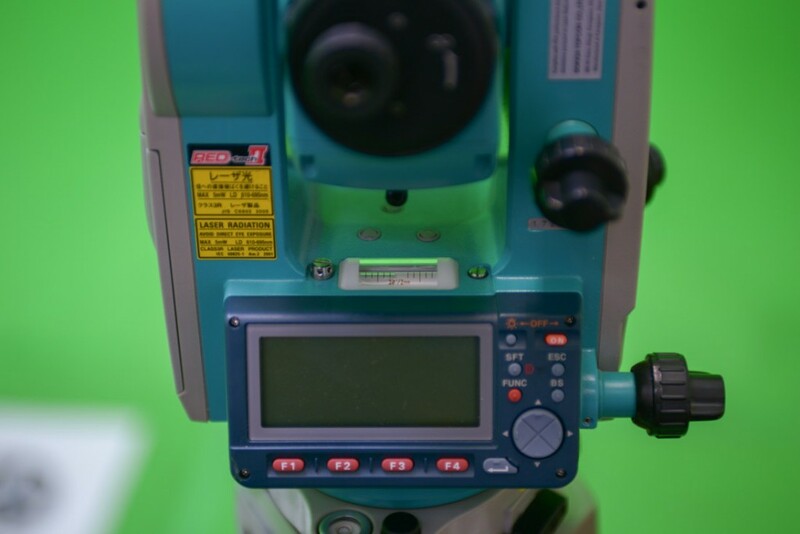 Total Station with Reflectorless Mode – this allows the total station to take measurements without the use of a prism or reflective stickers. 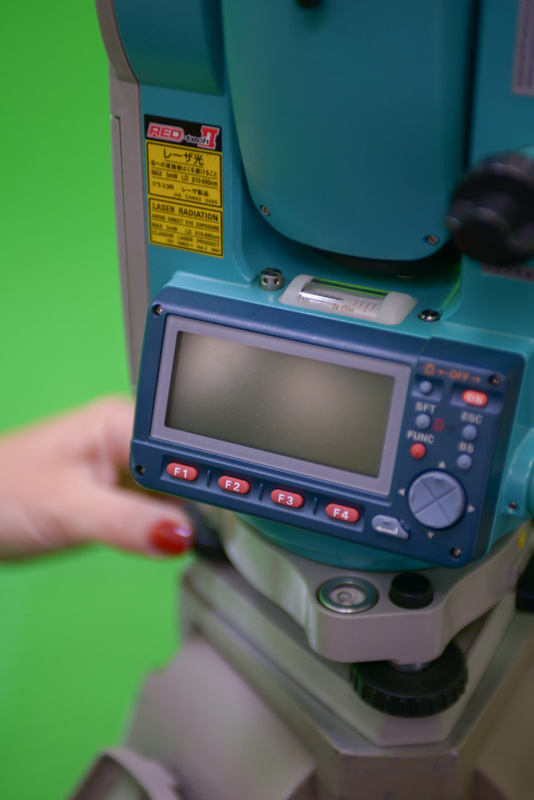 Right Angle Eye Piece – for surveying points overhead, a 90-degree eye piece makes it easier to see the targets. 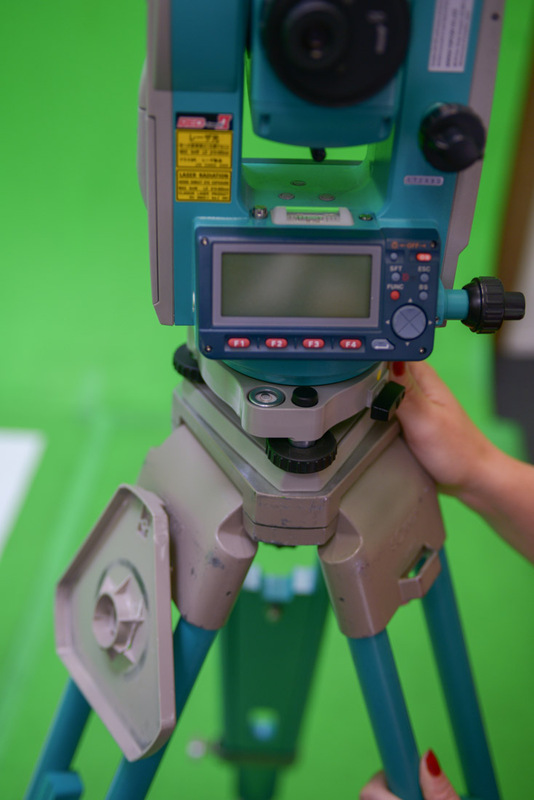 Total Station Tripod and Spreaders – the tripod and tripod spreader are important tools. Without these, the survey gun cannot be properly leveled. 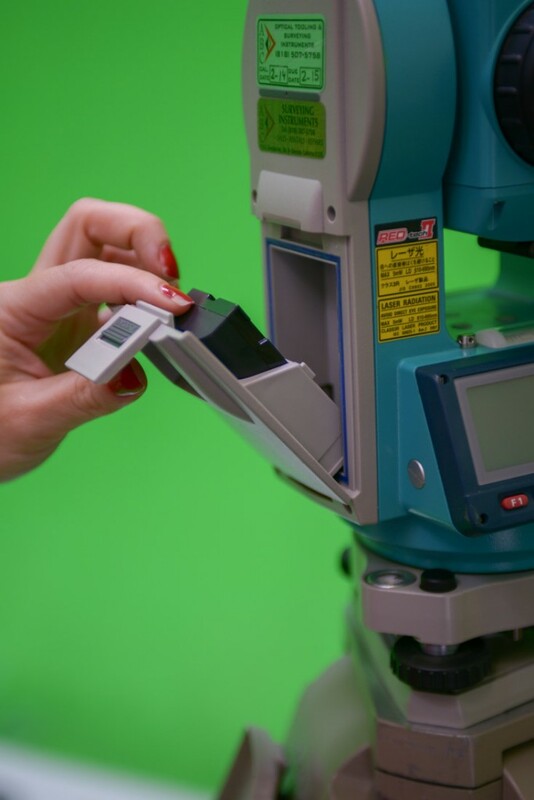 When working with professional surveyors, their tools may differ. 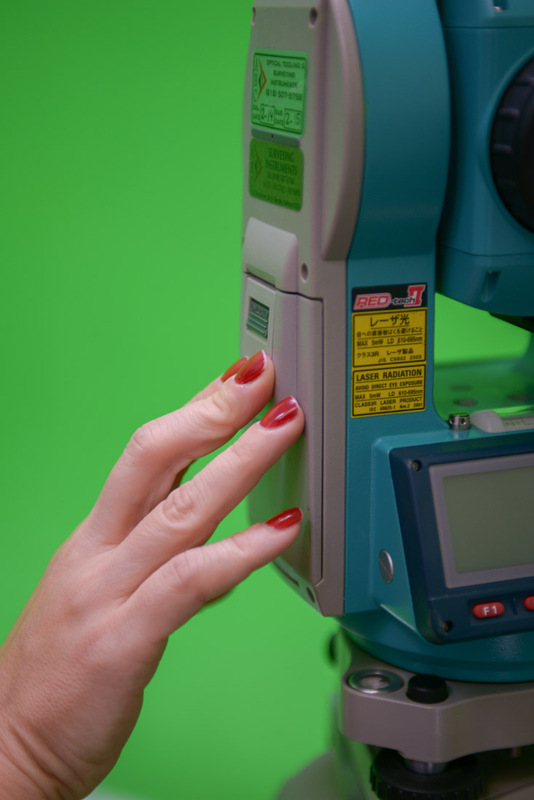 Read notes about this on Surveying for Visual Effects. 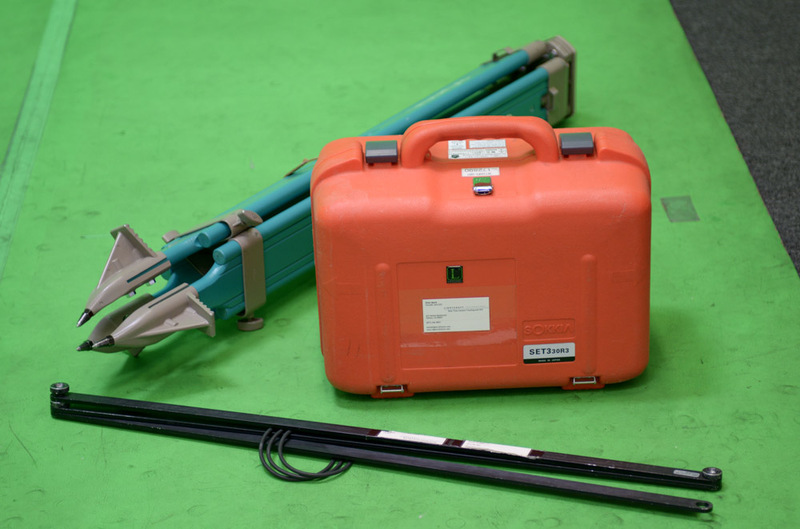 The survey instruments often come in their own transport bags or protective cases. 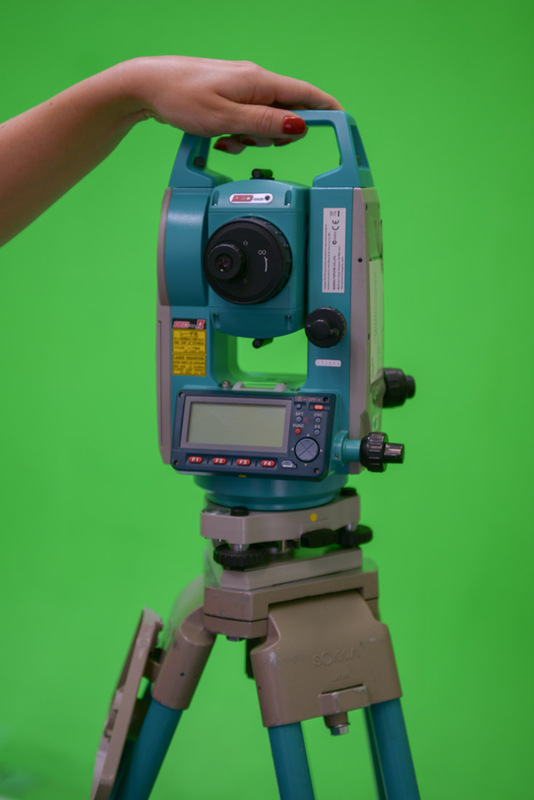 When picking the place to set your survey instruments, keep in mind that the first place you set the survey tool will become the “Origin” of the survey. That will be the place where all measurements will be measured from. Make sure the first physical setup has enough clear line-of-sight to the center of as many targets as possible. 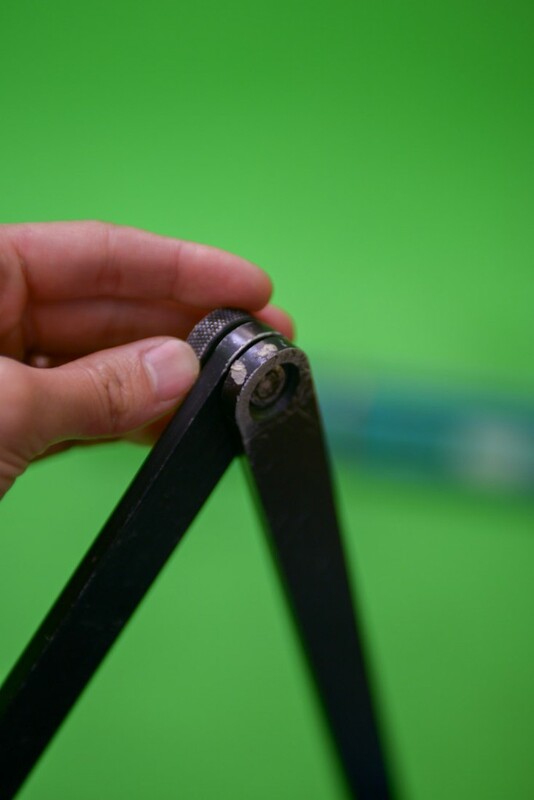 We start by assembling the tripod spreaders or tripod stabilizer. 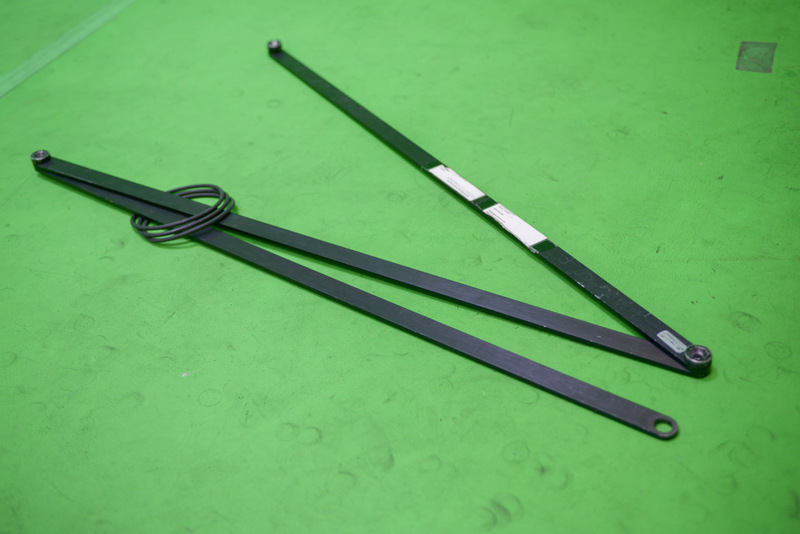 The spreaders have three rubber rings and is made up of three steel bars with threading and screws on the ends. 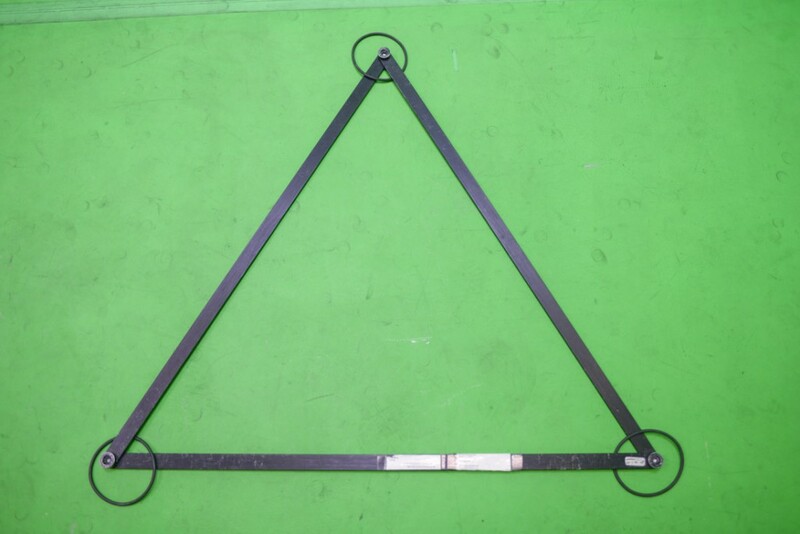 With the rubber rings around the steel bars, join the two ends of the spreaders forming a triangle. 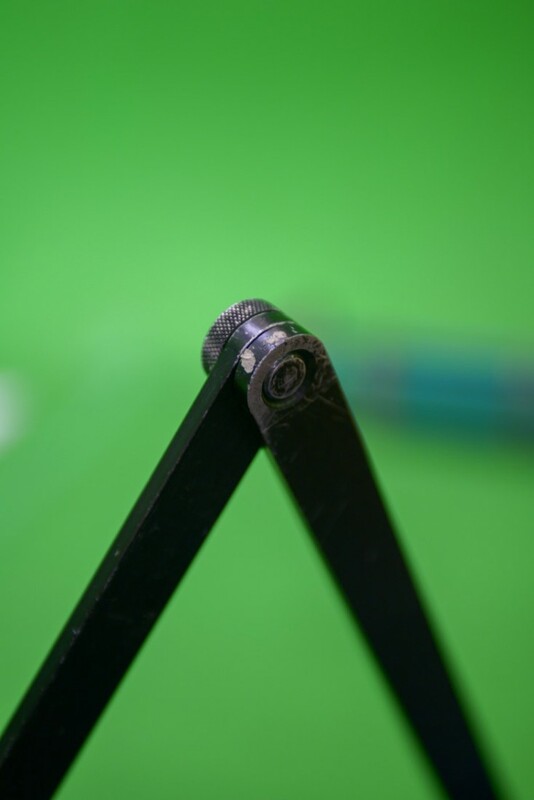 Unscrew the thumb screw and place the end without a thread on top of the threaded end. Place the screw through the two parts and tighten firmly. The screw will be holding the parts together. 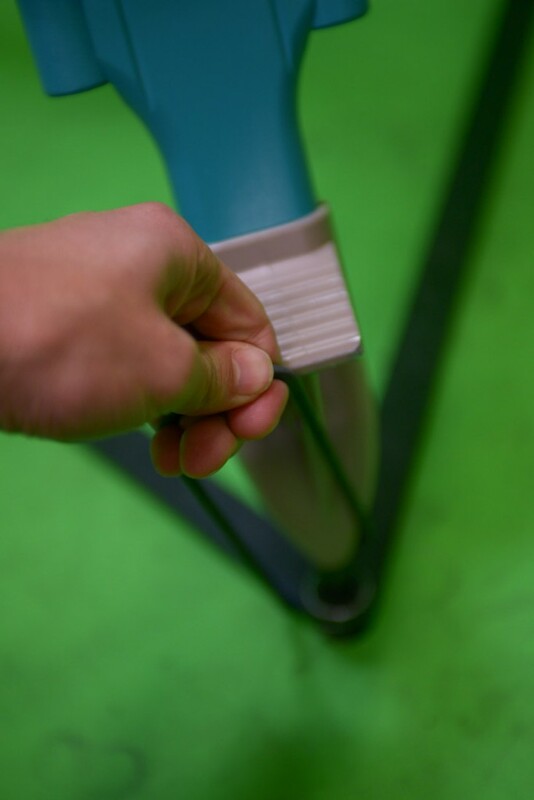 With the spreader on the floor, position one rubber ring in each corner. The ring should be in the space under the raised bar on each corner. We are ready for the wooden tripod. 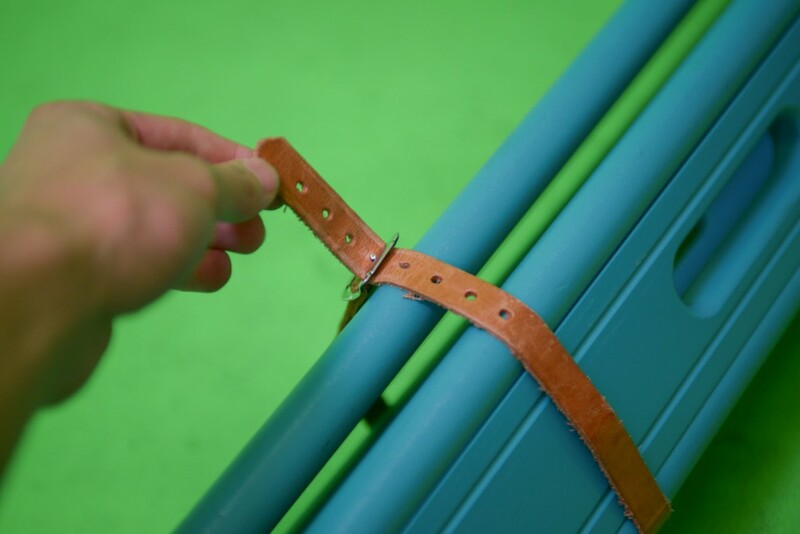 Undo the leather loop and spread the tripod legs. 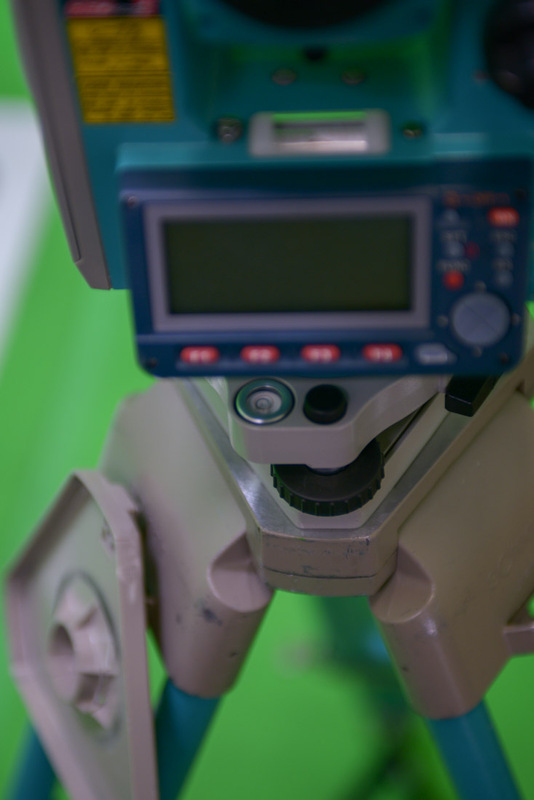 With the tripod upright, position each one of the legs’ spike on the center of the thumbscrews on the spreaders. 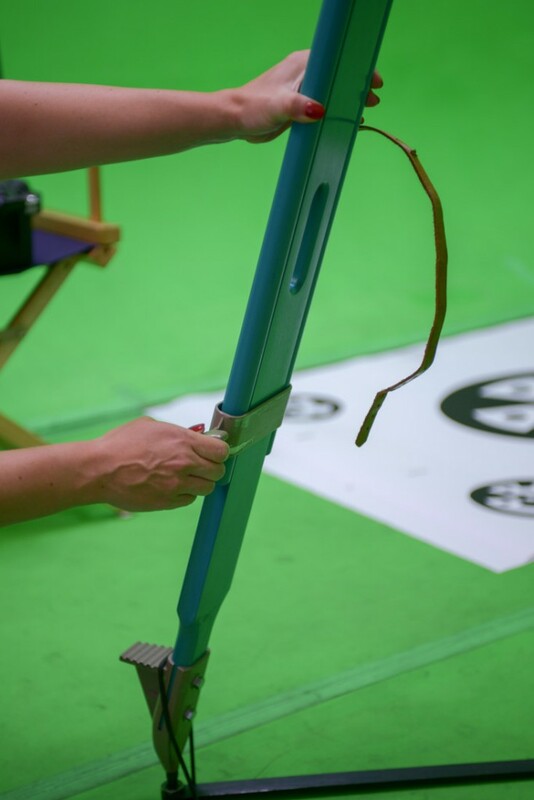 Holding the tripod down, stretch the rubber ring on top of the tripod’s foot. 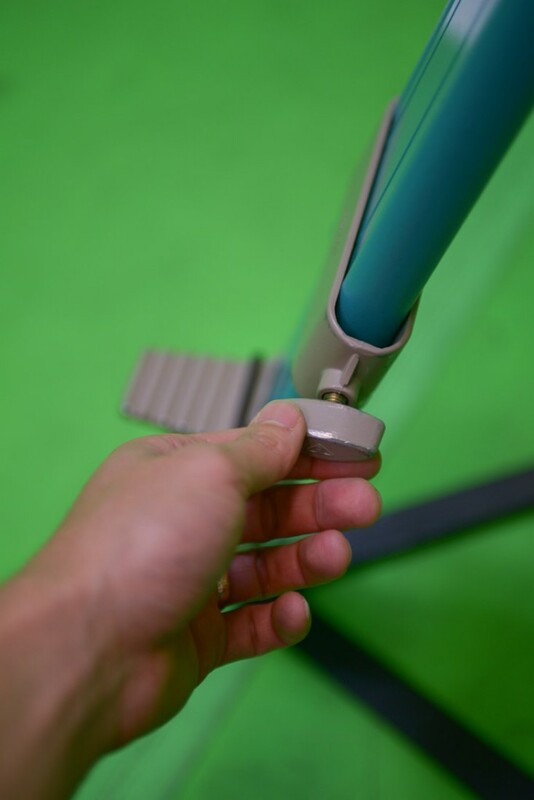 This should be done for each tripod leg. 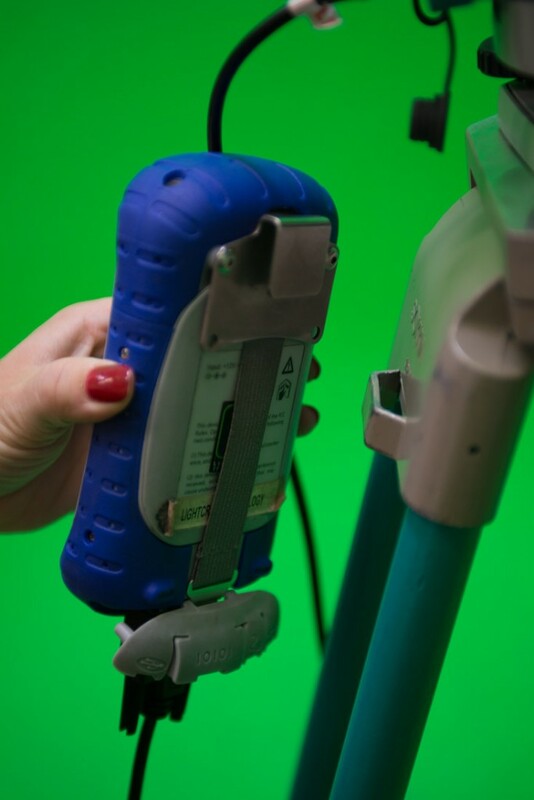 This makes the tripod and the spreaders move as one. 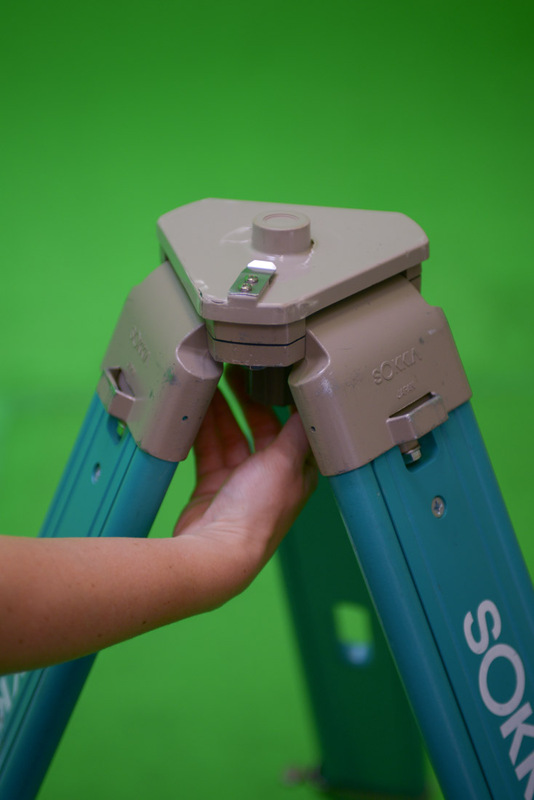 One leg at a time, raise the tripod to a comfortable working height. 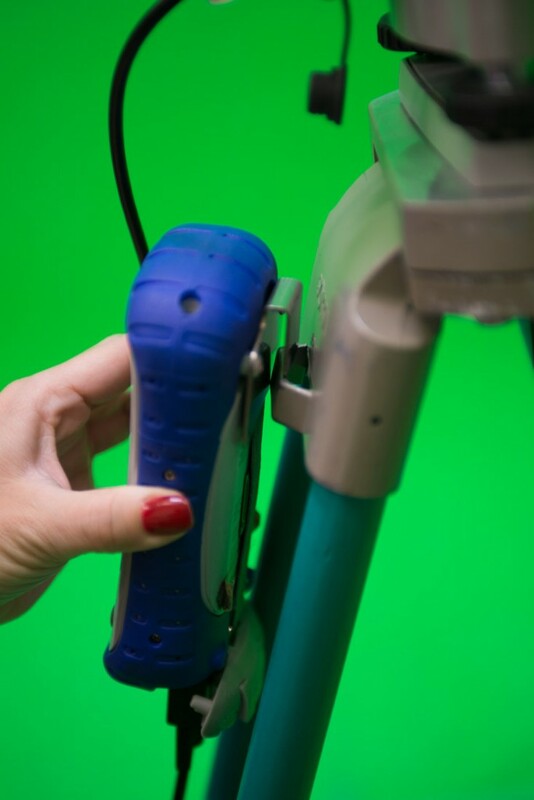 Undo the butterfly screw with one hand and raise the tripod with the other. Finger tighten the butterfly screw at the proper height. Repeat this for each leg. We will now remove the top mount screw cover. 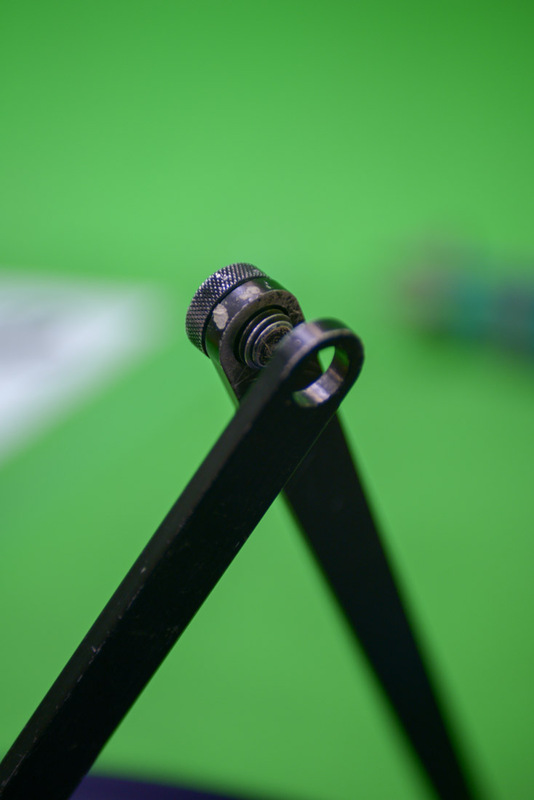 Undo the large hand screw under the top mount of the tripod. There is a metal clip on the cover. Secure the cover on the raised side mounts on the tripod. 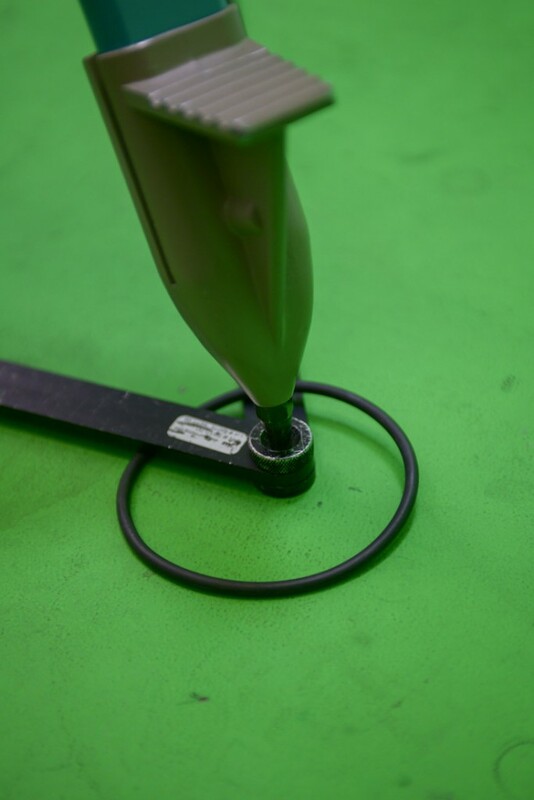 The cover should clip securely to the mount. 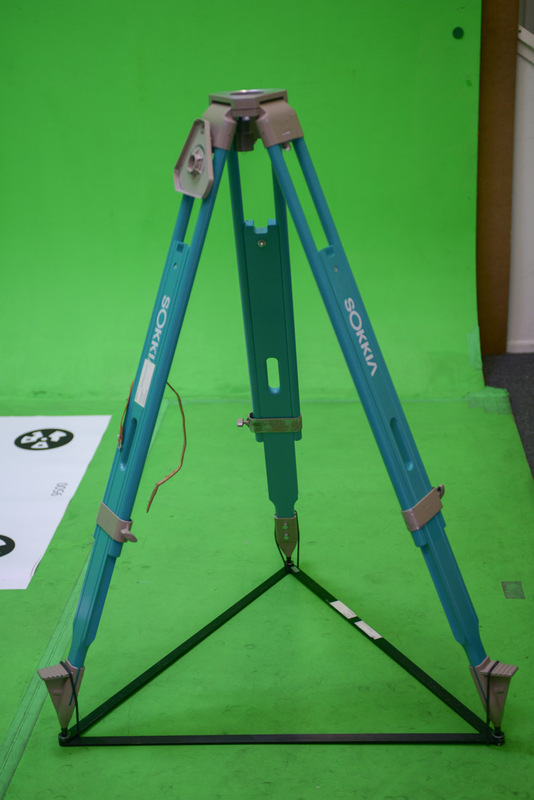 The tripod is now ready for the survey gun. The survey gun will need to be mounted on the tripod and leveled. 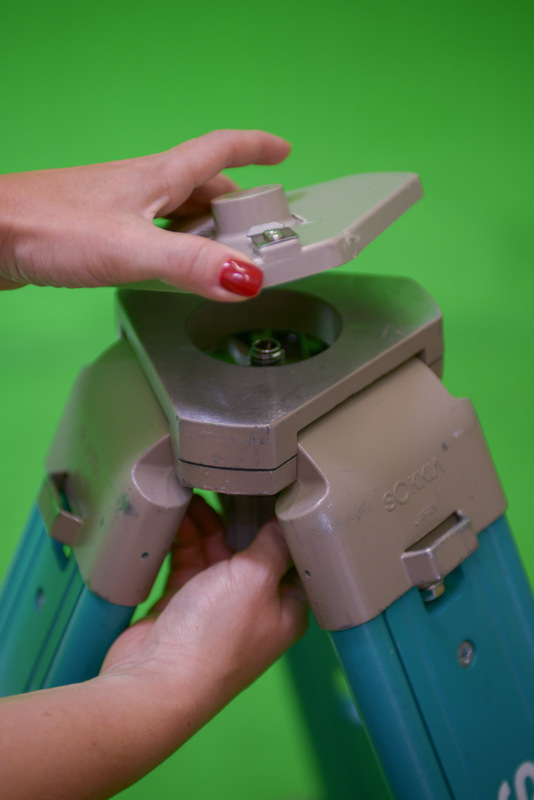 Using both hands, place the survey gun on top of the tripod. 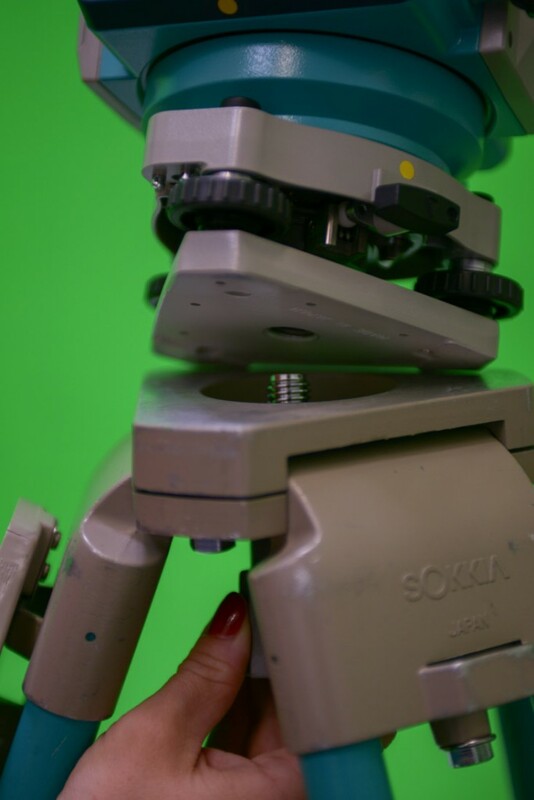 Align the screw on the top of the tripod with the threaded hole in the base of the survey gun. Still holding the survey gun, firmly tighten the screw to the survey gun. 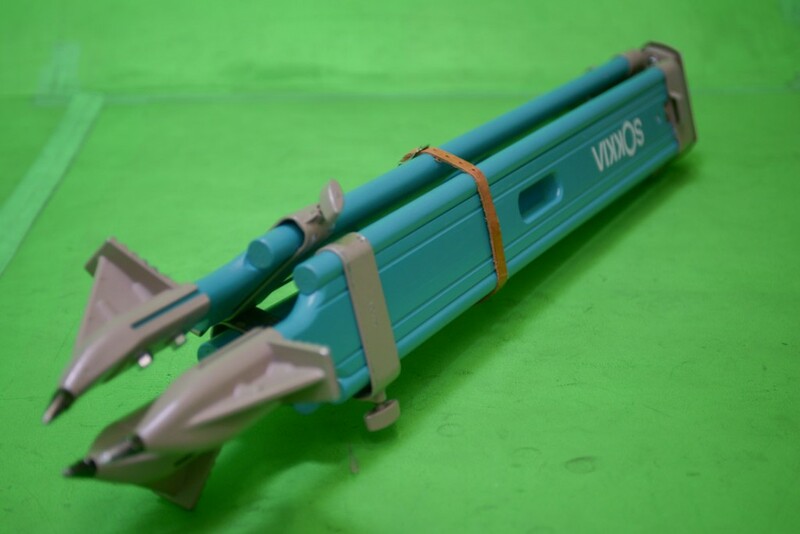 Still holding the survey gun, check that the instrument is securely fastened. We are ready to insert a battery to the survey gun. Locate the side of the gun with a small latch. 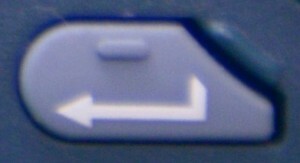 The latch releases by pushing the gray tab down. This releases the latch. Pull to open the small door for the battery. Insert the proper battery with the pins facing down. Gently close the battery compartment door. Lock the door latch by pushing the tab in. 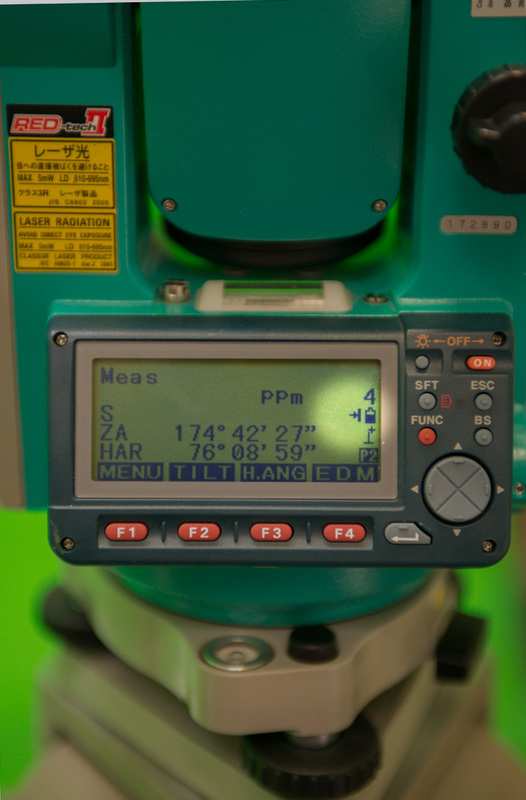 In order to properly measure points, the survey gun needs to be properly leveled. 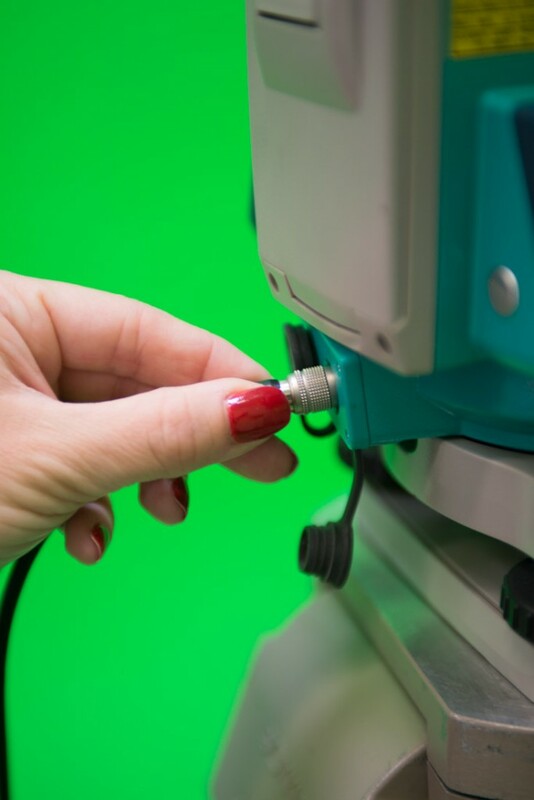 There are three levels of leveling the survey gun: two analog and one electronic. 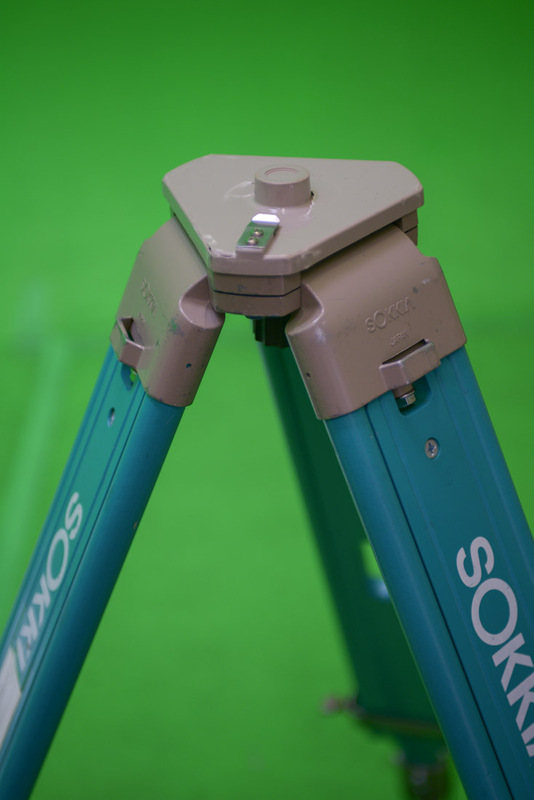 Some survey guns are equipped with just two levels: one analog and one electronic. First we do a coarse leveling. Locate the coarse circular bubble level. At this point, the bubble will not be leveled. Using the tripod legs, one at a time, level the survey gun looking at the coarse bubble level. Repeat this process for each leg always looking at the circular bubble level. Get the bubble as close to the center of the bubble level as possible. Next, we will do a semi-accurate leveling. 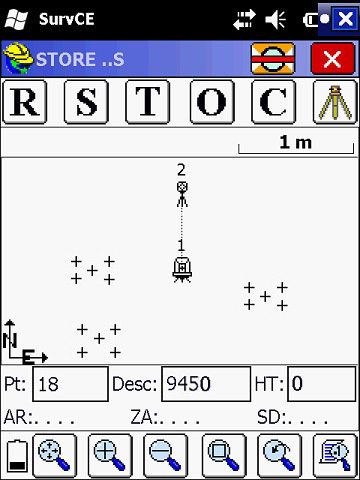 For this, locate the long bubble level on the side of the survey gun. If your survey gun is not equipped with a long bubble level, skip to step 13. Locate the pan lock and unlock pan by gently turning it 90 degrees to a horizontal position. 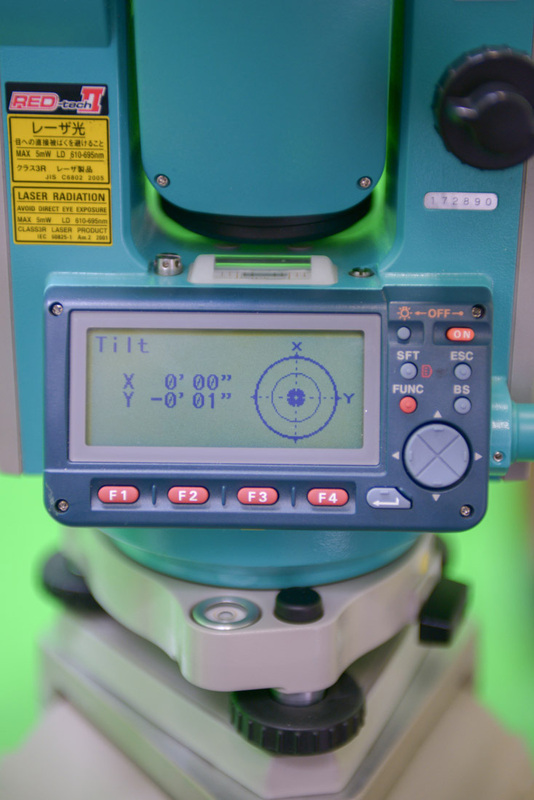 Rotate the instrument to make the display parallel to two of the bottom leveling screws. There are three of these back leveling screws. Align the display to any two of them. 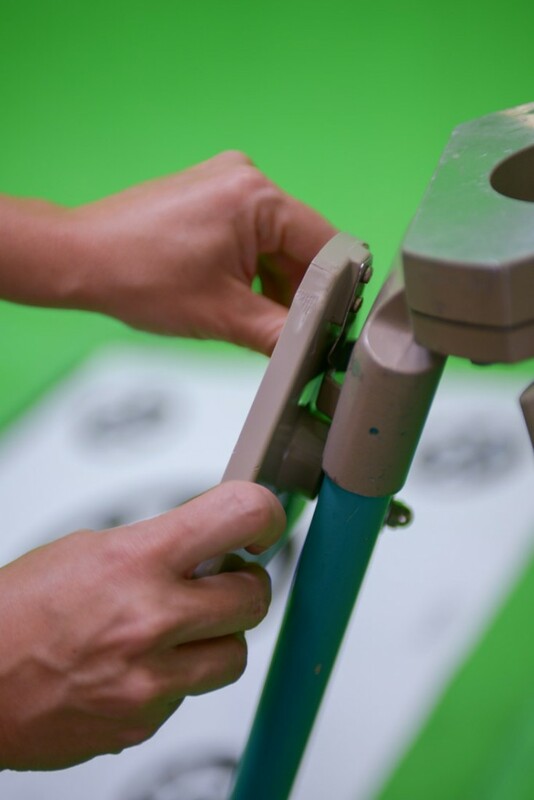 Using just one of leveling screw at a time, rotate the screw to adjust the long bubble level. Spin the screw counter-clockwise (left to right) to make the bubble move right and clockwise (right to left) to make the bubble move left. You are done when the bubble is centered within the two larger lines. Rotate the instrument 90 degrees. Aligning one of the sides of the gun square to two of the alignment screws. The other side of the survey gun will be aligned with the third alignment screw. Rotate this screw to level the instrument. Spin the screw counter-clockwise (left to right) to make the bubble move right and clockwise (right to left) to make the bubble move left. Next, we’ll do an accurate-leveling. For this, we will need to turn the instrument on. If the instrument is not turning on. Make sure you have a battery in the instrument. 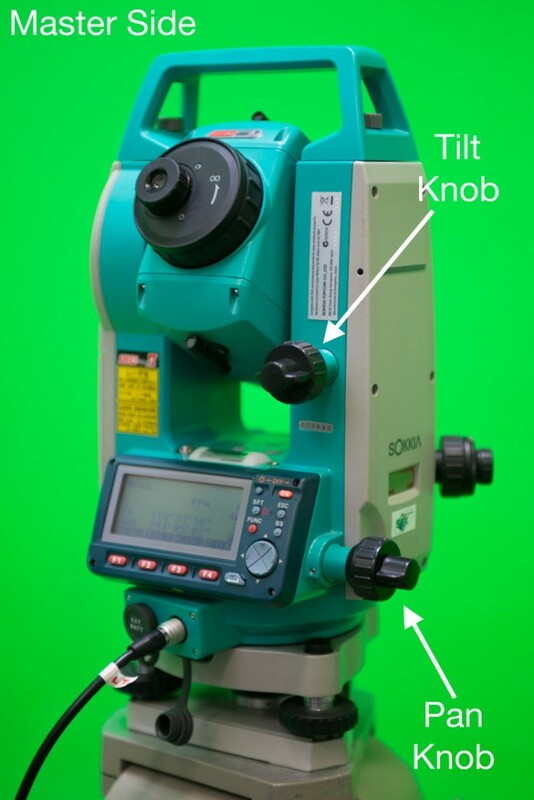 Some total stations start up with the electronic tilt automatically. 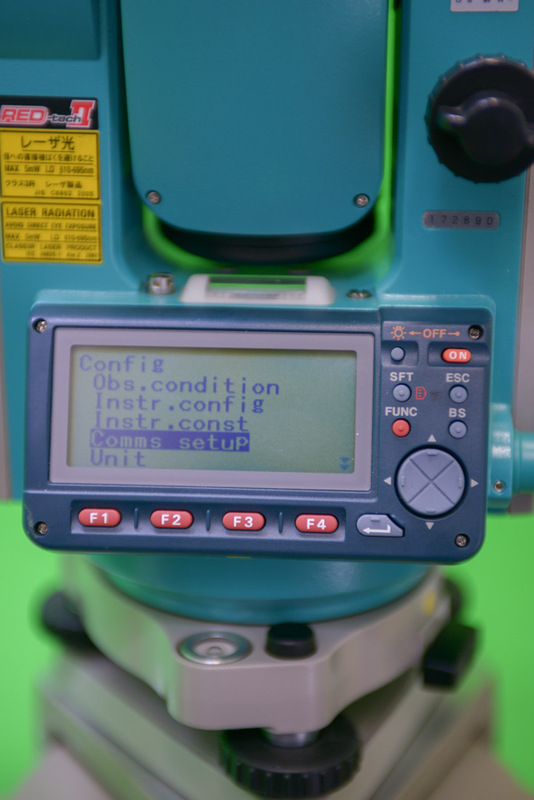 If your total station is already on the TILT screen, skip to step 16. 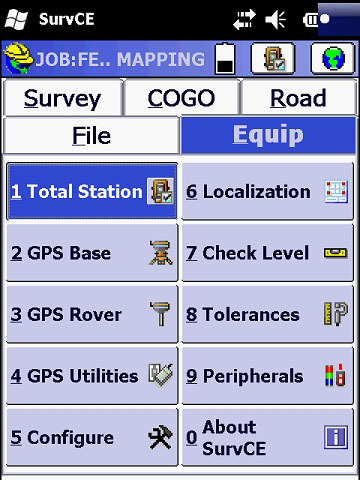 If it does not go to the level, on the main screen, locate and press FUNC to toggle the function keys. When the option TILT shows as one of the function keys, press that function key. In the image below, we have F2 as our TILT. This will show a very accurate electronic version of the analog levels. We need to level the instrument as close to zero minutes and seconds as possible. 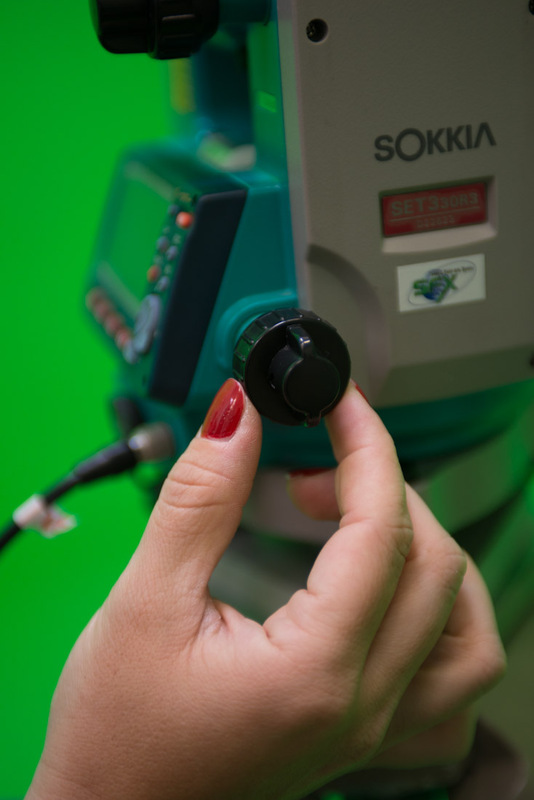 Just like before, use one leveling screw at a time to level the instrument. Note that, the adjustments should be very subtle at this point. You are done when the tilt angles are close to zero. At this point, the instrument’s leveling is so precise that standing next to the instrument from different sides will offset the level. 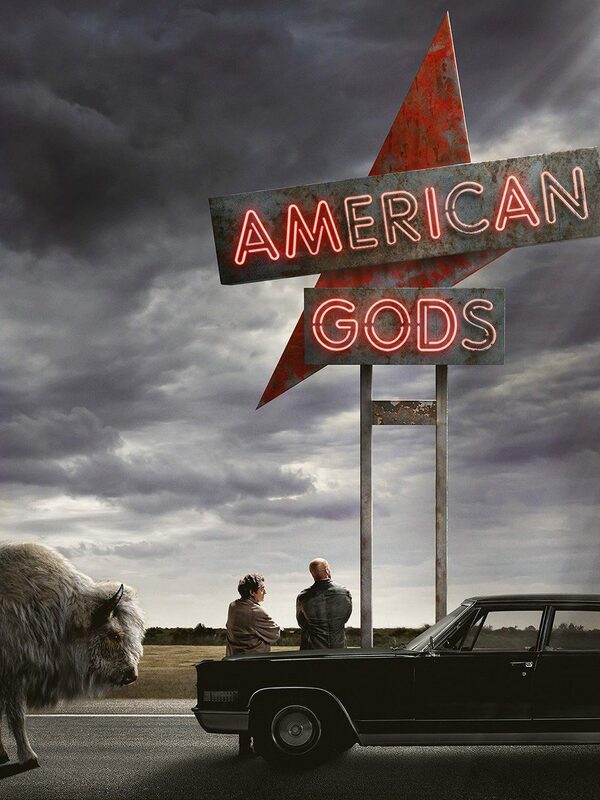 To exit this screen, press ESC. This takes you to the main menu. You are ready to setup your Data Collector. 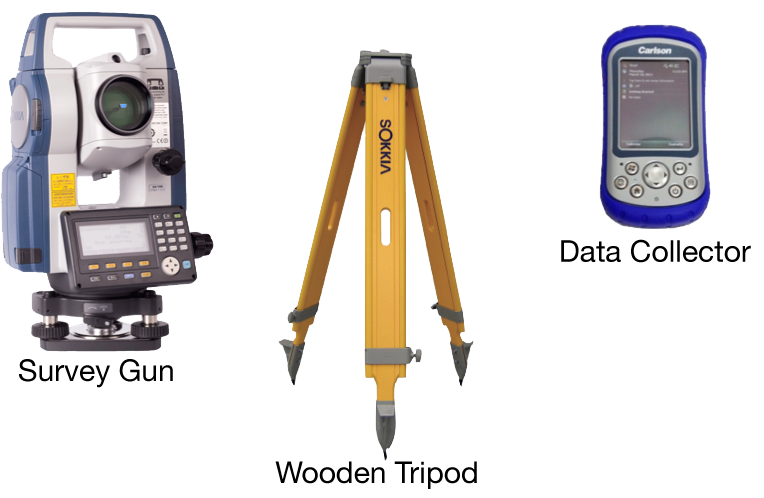 Total Stations sold by Lightcraft Technology are pre-configured to work with the serial cable as well as Bluetooth, when available. 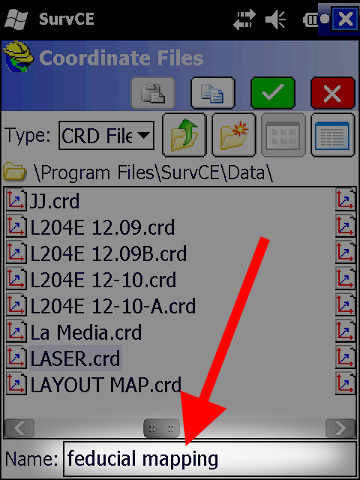 From the main screen, press ESC to see the access to the CONFIG option. Using the “F” buttons, select CNFG. Using the arrow buttons, arrow down to highlight Comms setup. Press the enter ( ) button to enter the menu. 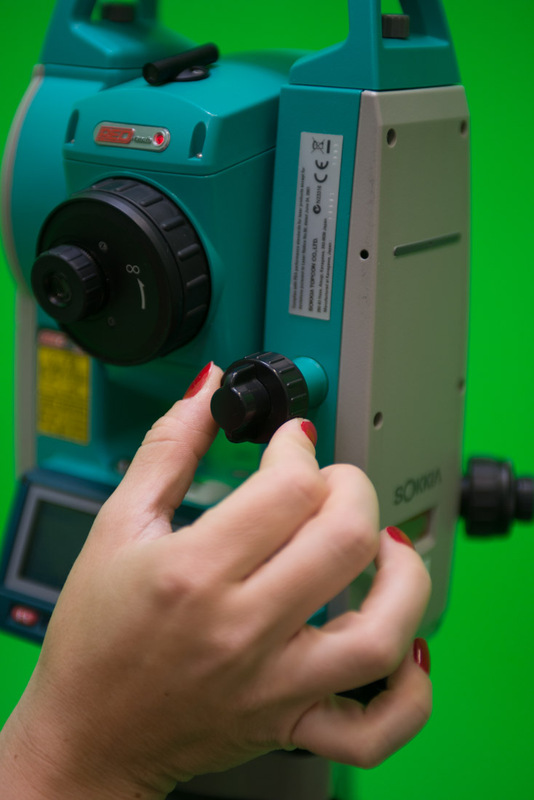 To survey regular surfaces without the aid of a prism or retro-reflective material, you will need to set the Total Station to reflectorless mode. 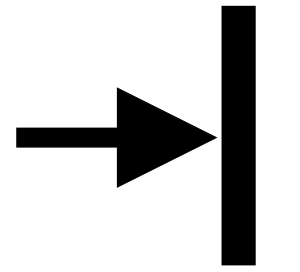 Next to the Battery Icon, there will be one of three icons indicating the mode the survey gun is in. 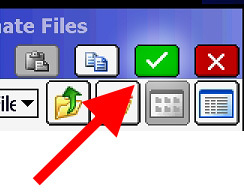 If you are seeing anything that is not this icon, press the SFT button toggling the modes until reflectorless mode is selected. 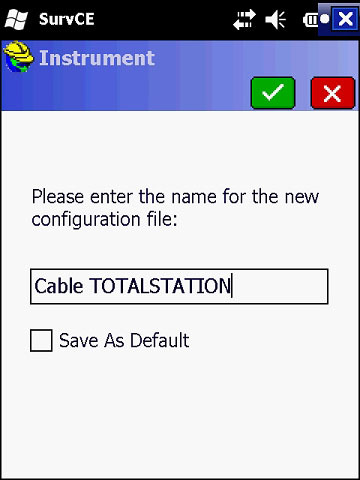 Press the (*) (star key) to view the instrument options. Use the Arrow up and Arrow Down ( ) to navigate to NP/P. 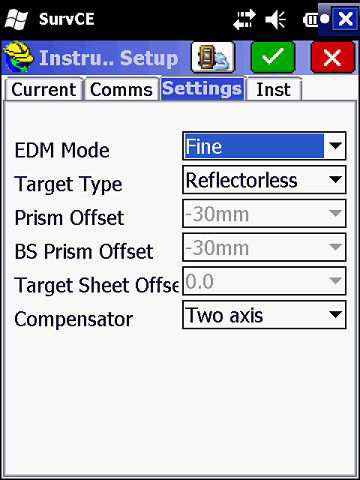 NP and P stand for Non-Prism and Prism, or reflectorless and reflector mode respectively. Set the device to NP mode, or reflectorless (Non-Prism) mode. In the main display you should see the NP indicator showing the system is in reflectorless mode. This setting needs to be changed every time the survey gun is turned off. The survey gun will default back to prism (or reflector) mode when it looses power. 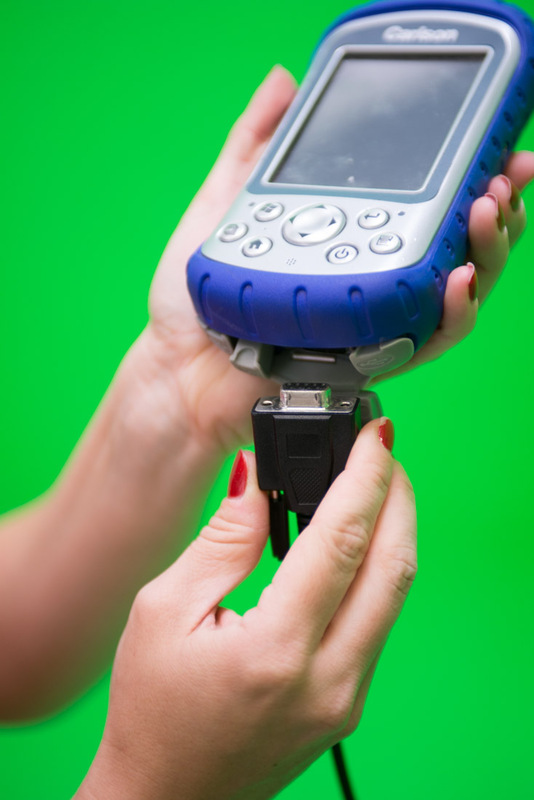 Some data collectors are equipped with Bluetooth, but it’s preferred to use the Serial cable for reliability over the course of your survey. 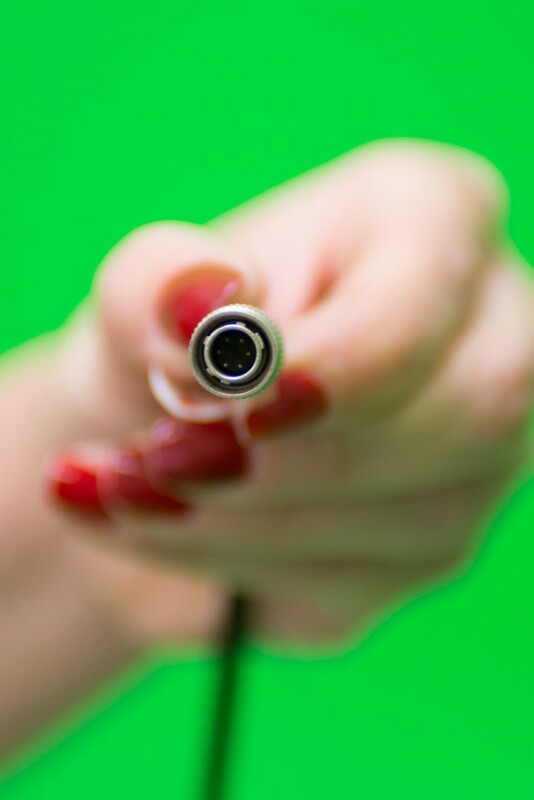 The Data Collector cable has a Hirose connector on one end and a Serial DB9 connector on the other. 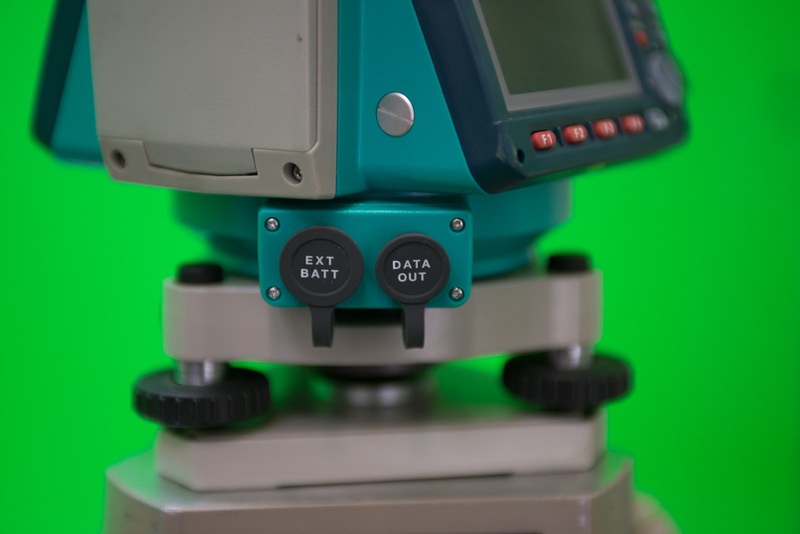 Locate the DATA OUT or DATA port on the side of your survey gun. This is often under a protective cover. Remove the cover to reveal the connector receptacle. 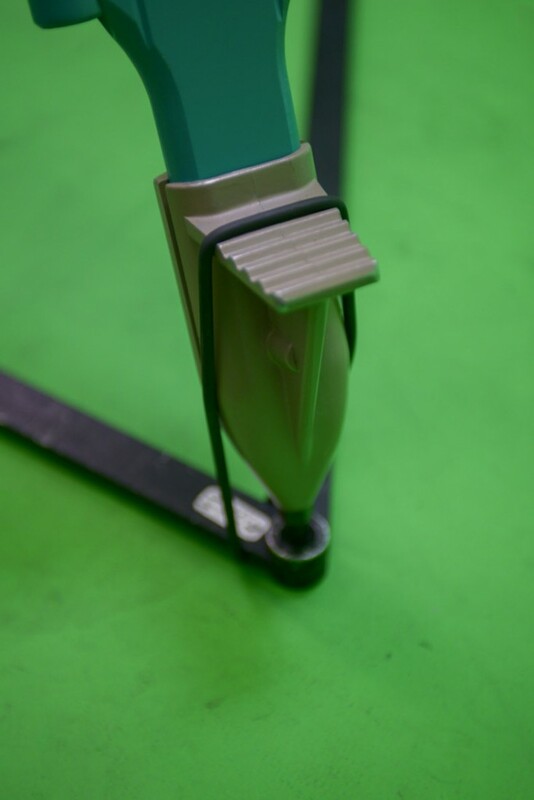 The male end of the connector will have raised keys to register the position to insert the connector. 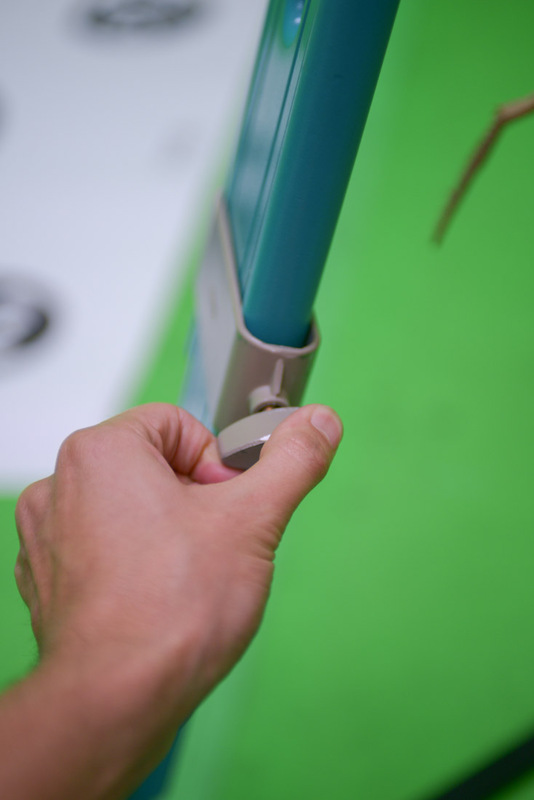 With the correct orientation, gently push the connector until it clicks in place. 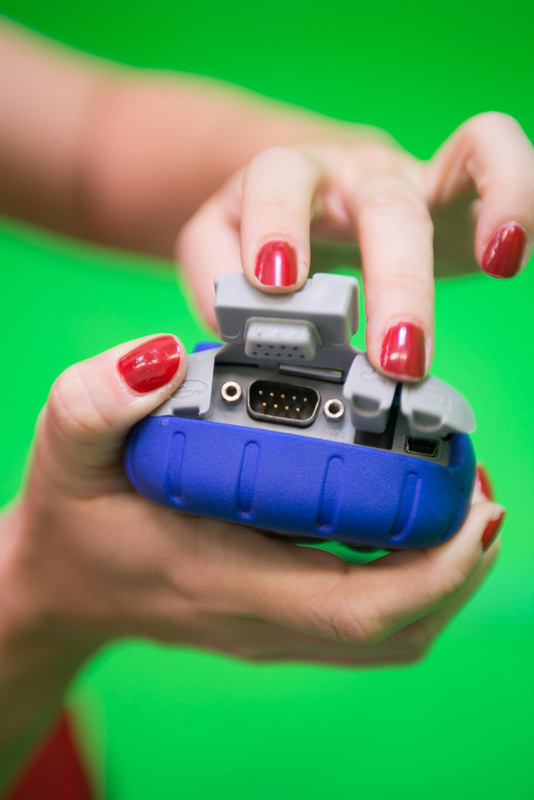 The Data Collector will have, usually at its bottom, a male DB9 connector. Connect the Serial Cable to the Data Collector. Use the thumb screws to lock the connector in place. The back of the Data Collector should have a metal clip. 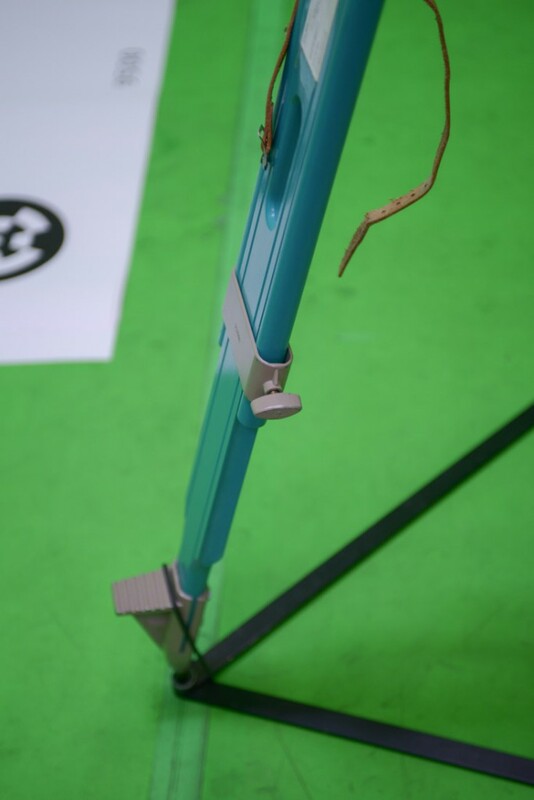 Use the metal clip to rest the Data Collector on the side of the tripod. 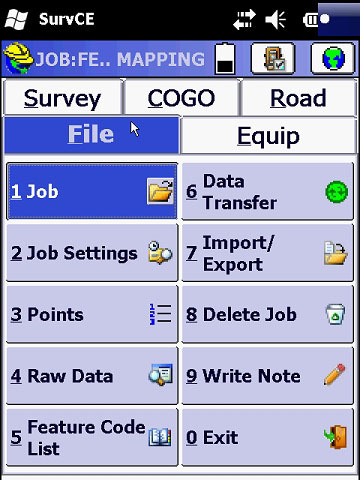 The Data Collector runs on a Windows Mobile OS. There is a small Windows icon in the upper left corner of the screen. This is the start menu. Tap on the start menu and select SurvCE. 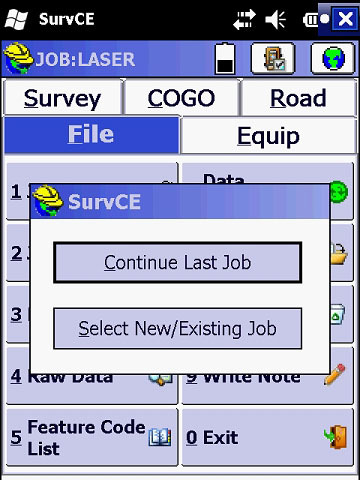 This opens SurvCE and prompts you to either Continue Last Job or Select New/Existing Job. We will begin with a new job. This will open SurvCE’s documents or jobs. By tapping the Name box at the bottom of the screen, you will be able to enter the name for your job. The SurvCe keyboard takes some getting used to, but all the functions are there. Once you have named your Job you are ready to proceed to setting up the job parameters. Confirm by tapping on the Green Check mark on the upper right corner. Confirm by tapping on the Green Check mark on the upper right corner. The next screen confirms the measurements for the first point. This first point is our Occupy Point, the point where the total station is currently sitting on. 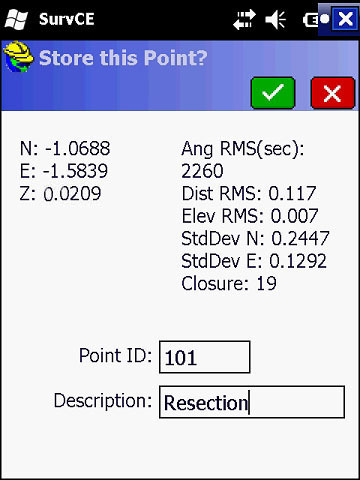 Northing, Easting and Elevation, make sure to set these to 0.000 meters. Description will be “Home”, “Start” or “OP” (for occupy point). This needs to have letters in the name (alpha characters). Confirm by tapping on the Green Check mark. This will take us to the main screen. Next we need to communicate with the Survey Gun. 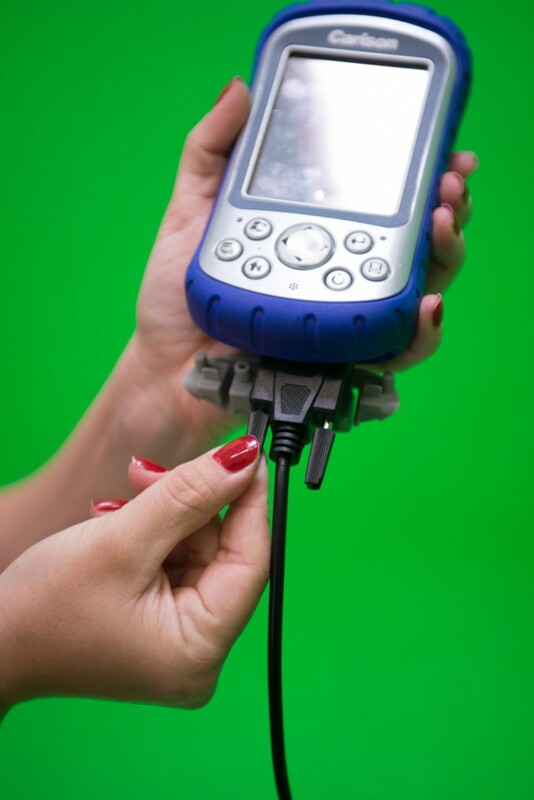 The Survey Gun needs to be powered on and connected to the Data Collector with the Serial Data cable. 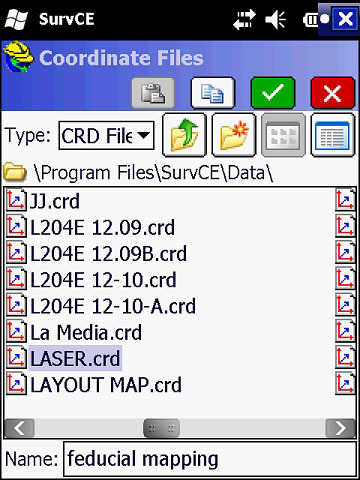 See Connecting Data Collector for instructions. On the Data Collector, select the Equip tab. 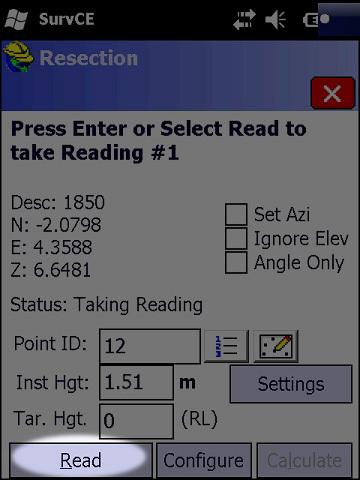 Then tap on Total Station. This opens Instrument Setup‘s Current tab. If you have a known preset that is saved, you may load it here. Otherwise, use the following settings to create your own setting and to save it. 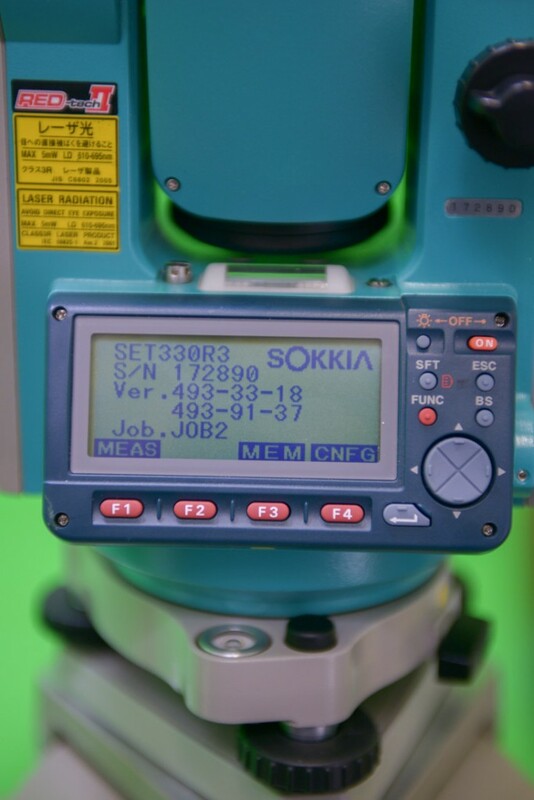 Under Manufacturer, select Sokkia or whichever is the correct manufacturer for your Total Station. 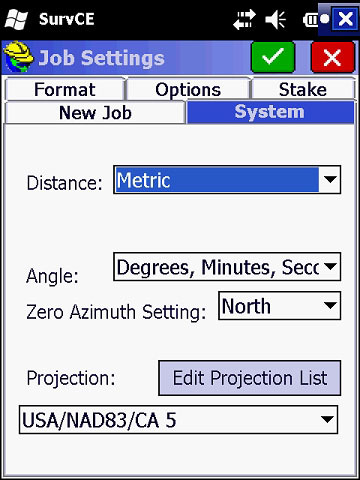 Then select the Model of your Total Station from the dropdown menu. 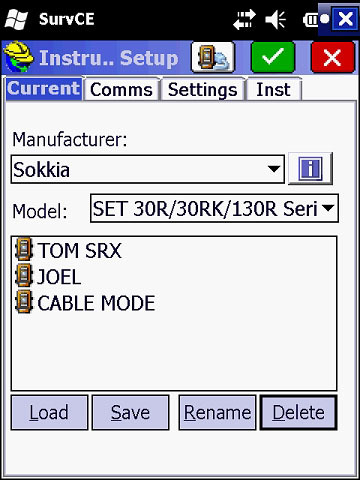 In this example, we are using a Sokkia SET 330R. 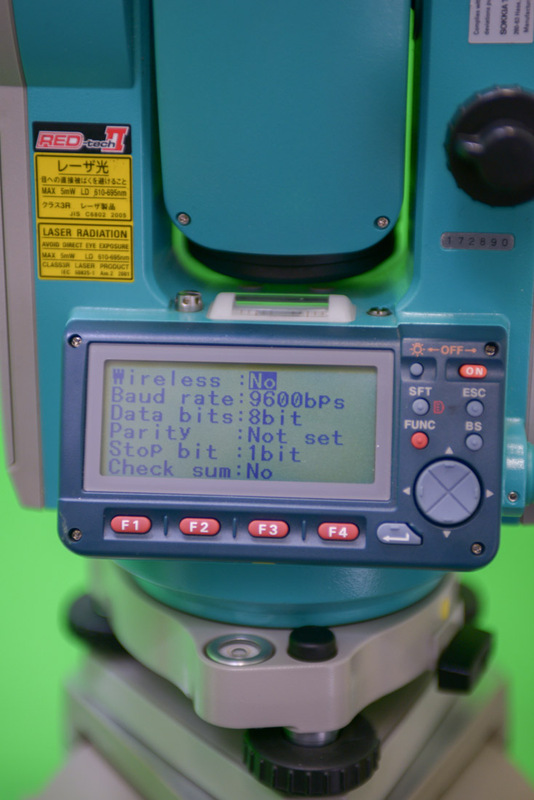 You may have noticed that the Data Collector settings match the Total Station Communication Setup. 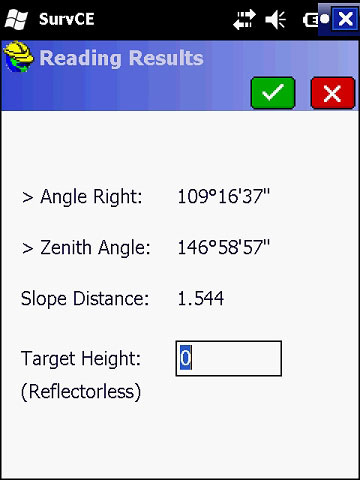 This tells the data collector to read points in reflectorless mode. 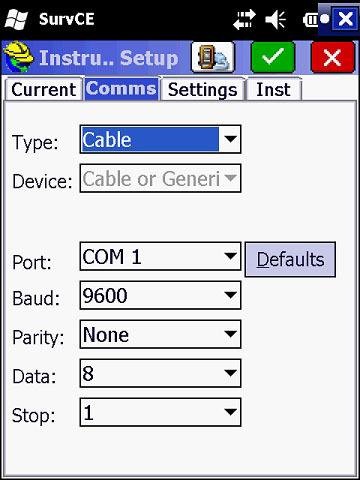 Finally, back to Current tab, under the list, select SAVE to save these parameters for future use.Mention in the name it’s a “cable” connection. Tap on the Green Checkmark for both windows. This will make the survey gun beep a few times confirming that the settings were received from the data collector. 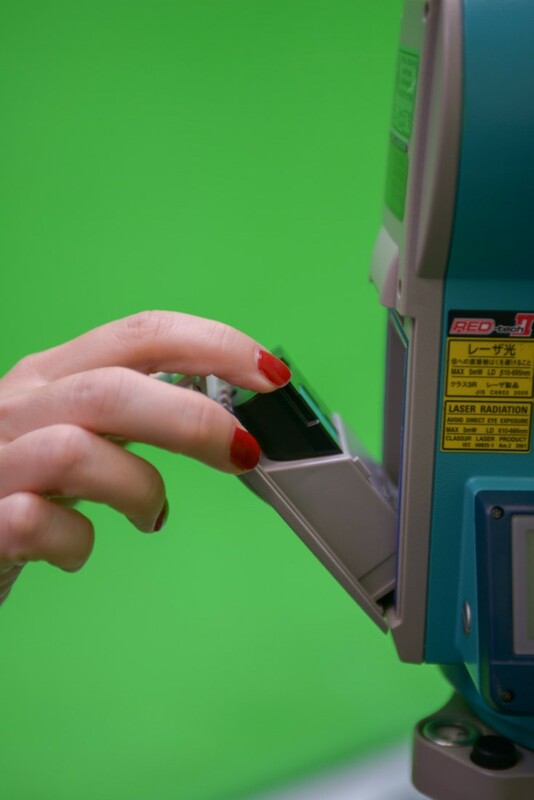 IMPORTANT: If the survey gun does not beep, check your settings again and make sure the Serial data cable is plugged in correctly.The data collector will return to the main menu. 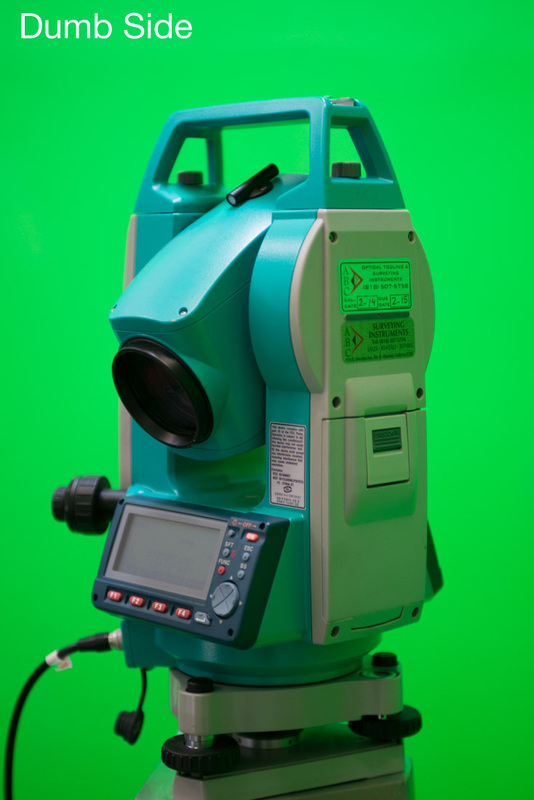 The Total Station or Survey Gun has two identical sides. The display and all the buttons are identical on either side. However, all measurements must be done from the master side of the instrument. 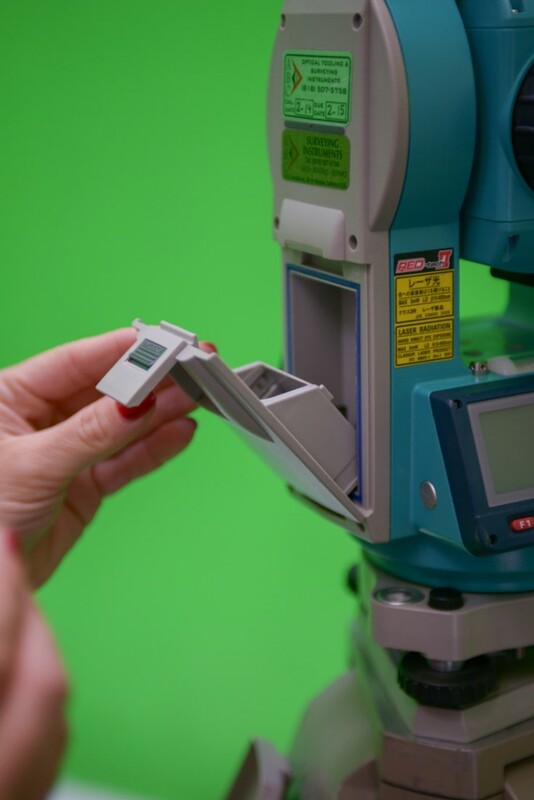 Whenever taking measurements, make sure to stand on the Master Side. The Master Side is indicated by the two adjustment knobs: tilt knob and pan knob. 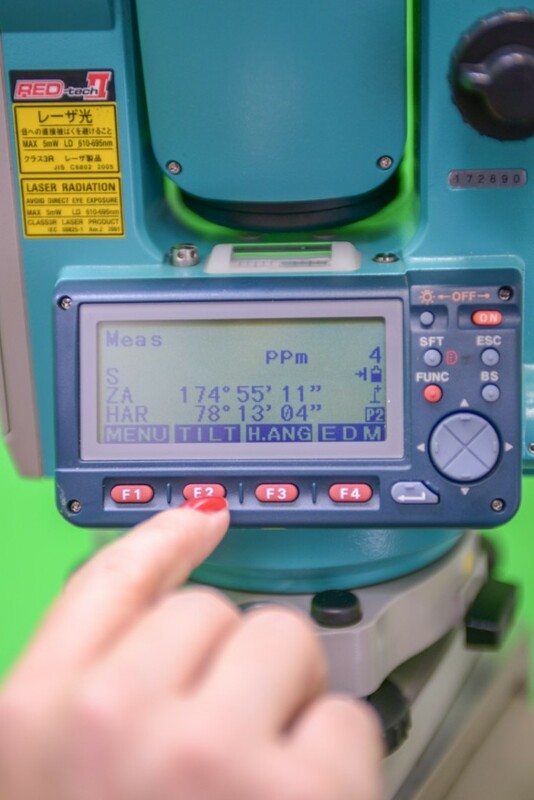 The Dumb Side has the same LCD display and all the same buttons, but you should not use it when measuring points. 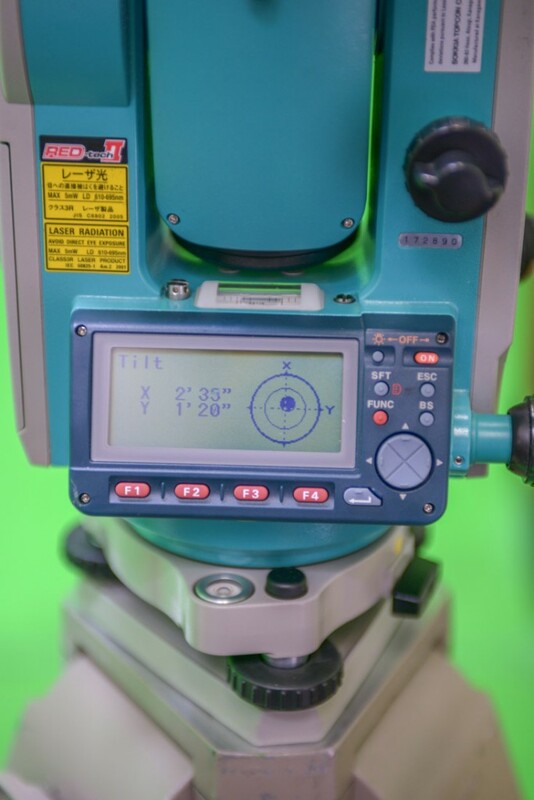 In order to measure points with the total station, the instrument needs a projection model that measures the distance of points based on the angle difference of an initial reference point in an Azimuth “heading”. This is called backsight point. 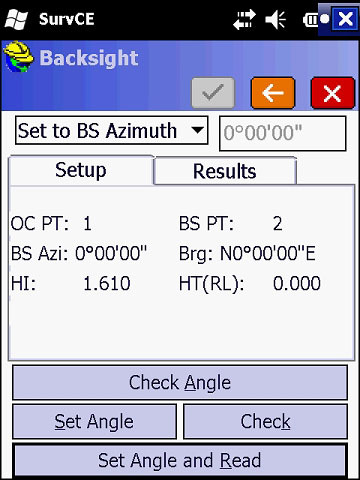 Backsight defines the orientation of the coordinate system. 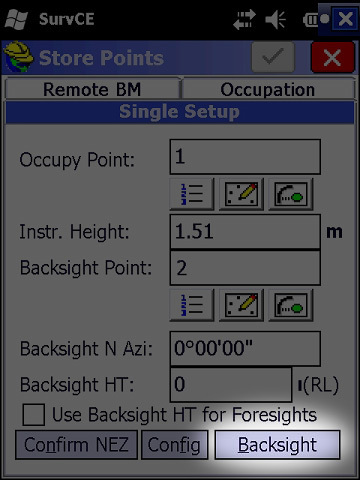 An easier way to think about backsight is to compare it to a map where the backsight determines which way is up. 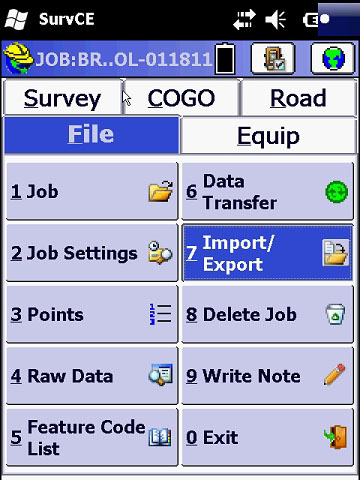 In the main SurvCE window, select the Survey tab and then Store Points. Next, we have the Single Setup configurations. Pay attention to the settings on this window. The first field is Occupy Point. You will notice that the Occupy Point is already entered. It defaults to the number “1“. When Setting Up SurvCE we save the first point, it becomes point number 1: the current occupy point. 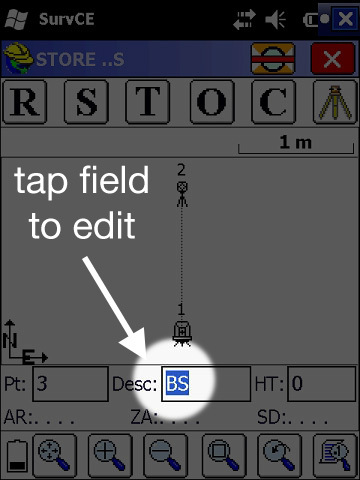 The second field is Instr. 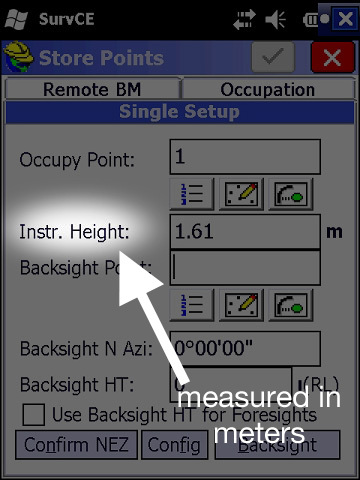 Height, short for “instrument” height. This is a measurement in meters from the floor to the reference line on the side of the survey gun. 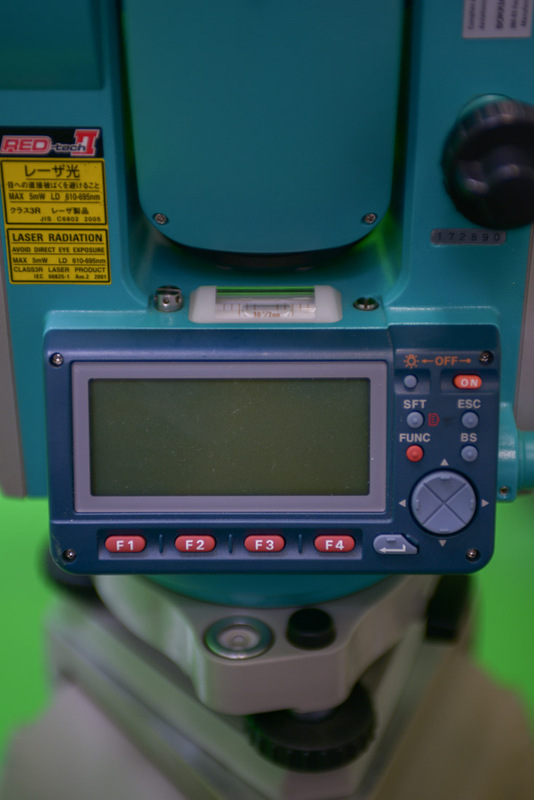 Identify the height reference line on the side of the survey instrument. Use a metric tape measure to measure the height of the instrument. 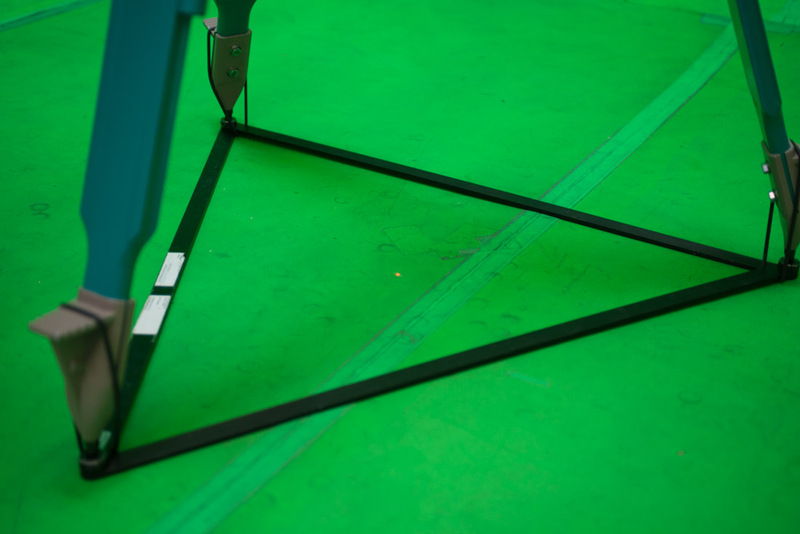 Position the tape measure as square and vertical to the floor as possible. Make sure to use measurements in meters. 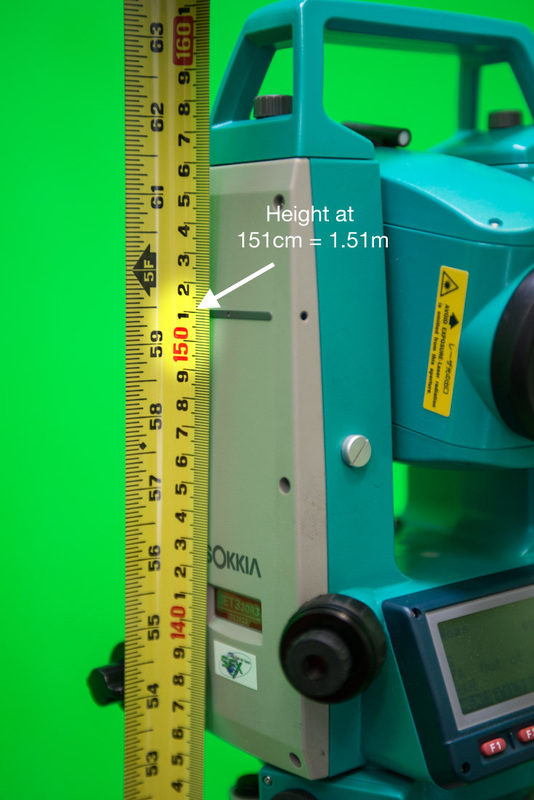 In the example shown, the tape measure is in centimeters: 151 centimeters is 1.51 meters. 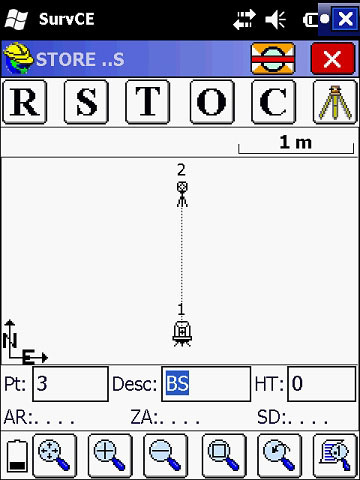 Enter the proper height measurement in the Instr. Height field. 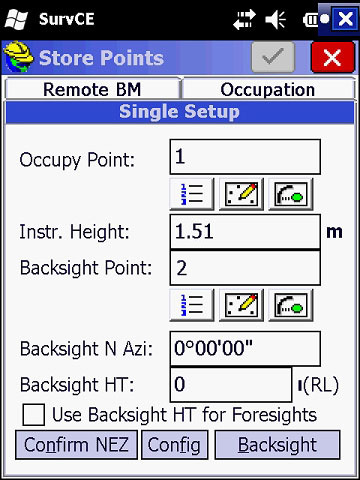 Next, we need to enter a number for Backsight Point. This field must be a number. Because we have not measured this point yet, we need to enter the value by hand. Since point ID 1 is our occupy point, the next available point ID is 2. We now need to measure the Backsight Point. 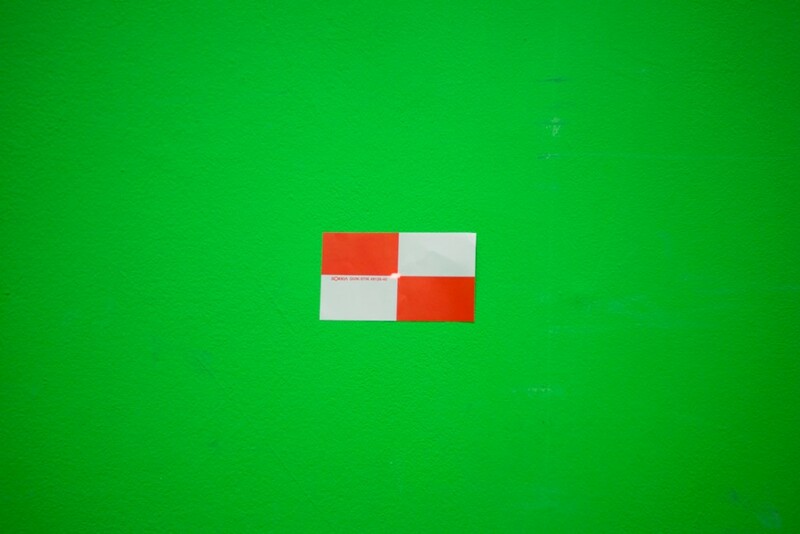 Pick a location in the stage that is somewhat square to the green screen and “forward” onto the screen. 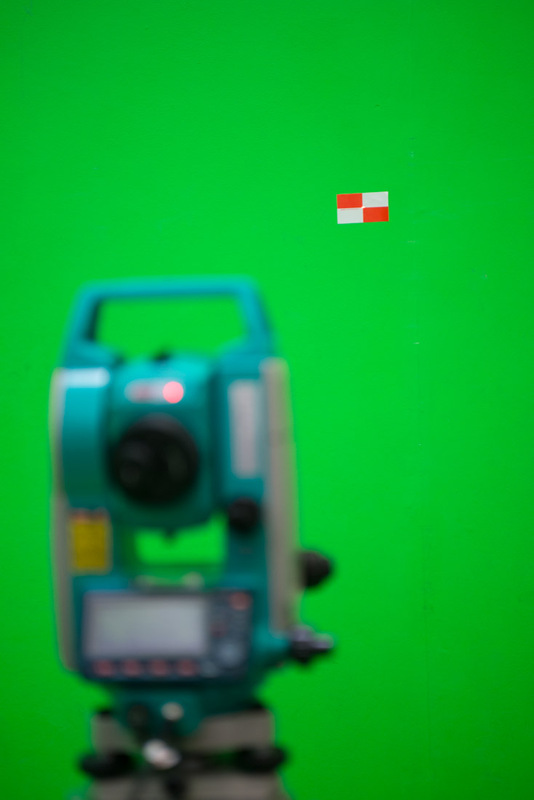 It’s helpful to use a permanent mark on the stage itself or the green screen. 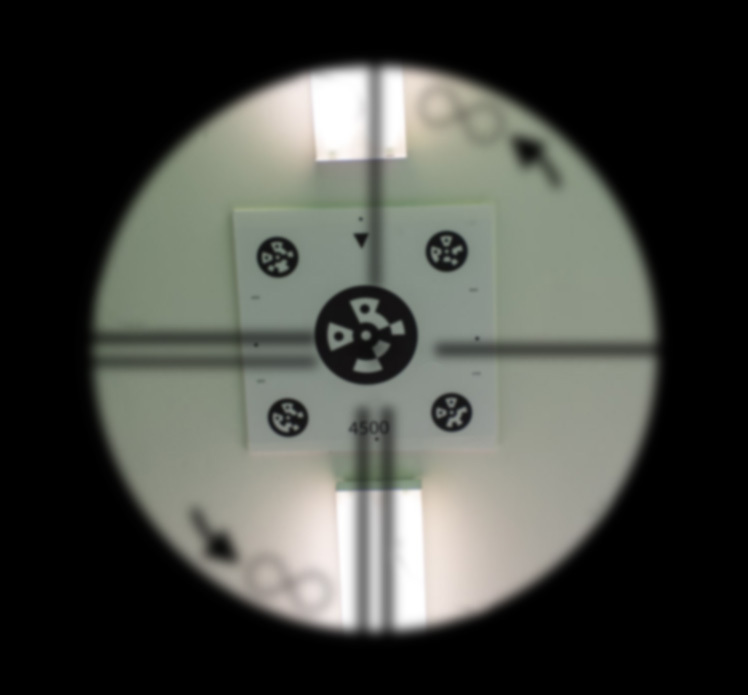 In some instances, it’s easier to add a “quick stick” sticker to where you want to place your “forward” axis (the x-axis in Previzion). 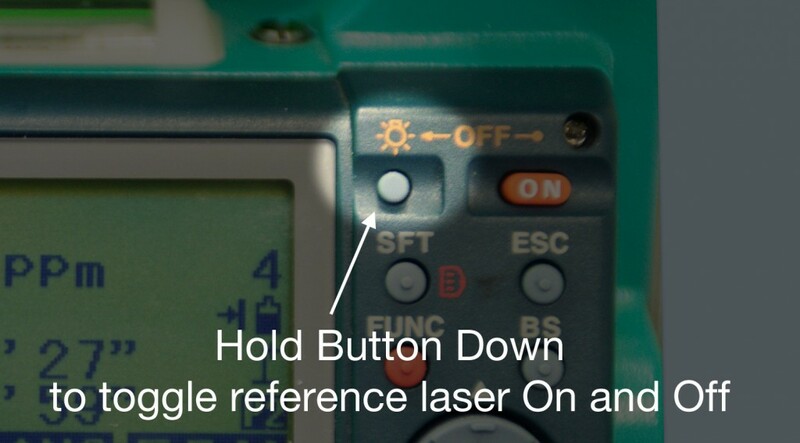 Turn the reference laser on by holding down the “Light” button until you hear the instrument click and the laser is on. 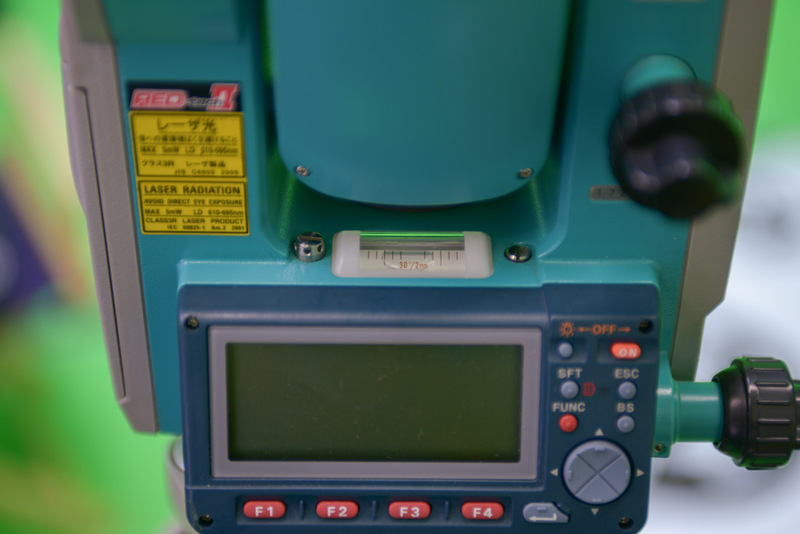 WARNING Direct laser radiation can cause vision damage. Avoid direct eye exposure. Do not stare into the beam. In order to properly point the instrument to a point, you need to unlock both tilt and pan with their respective butterfly locks. 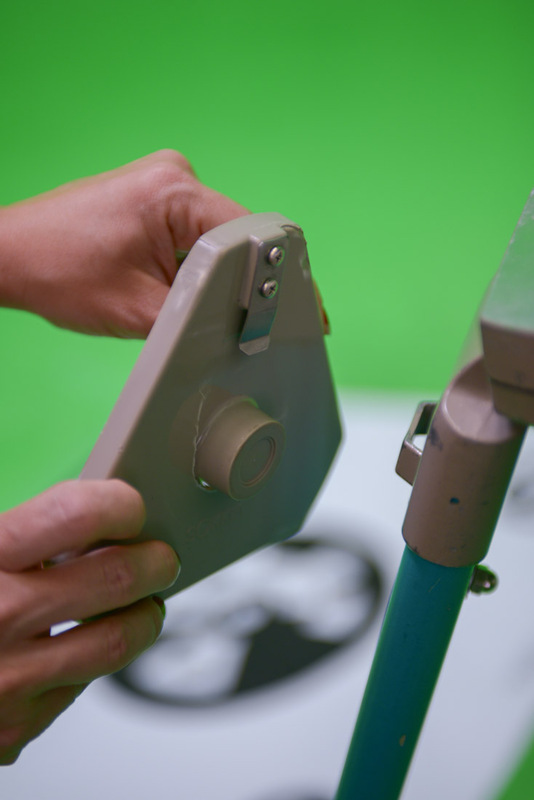 To unlock the tilt knob, turn the lock 90 degrees counter-clockwise to make it horizontal. Do the same to unlock the pan knob. 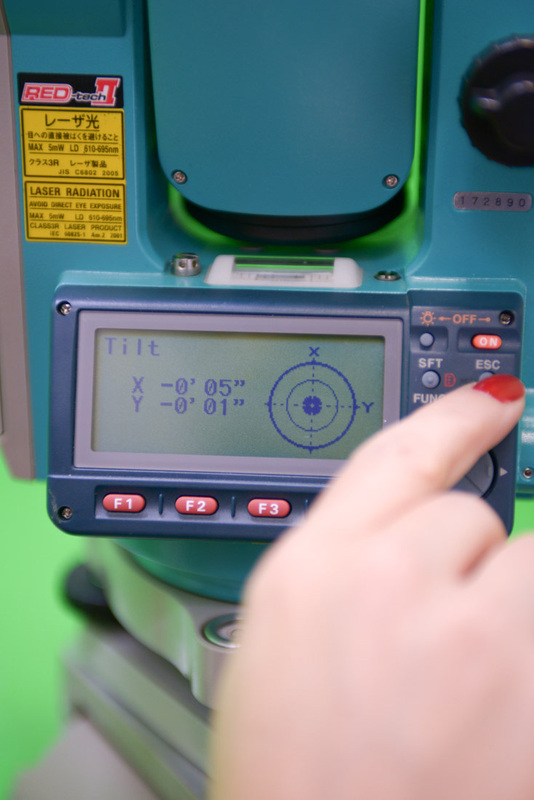 Using the laser as reference, you can now roughly point the tool station as close to the center of the target as possible. To lock the tilt knob, turn the butterfly lock clockwise by 90 degrees to make it vertical. Do the same to lock the pan knob. 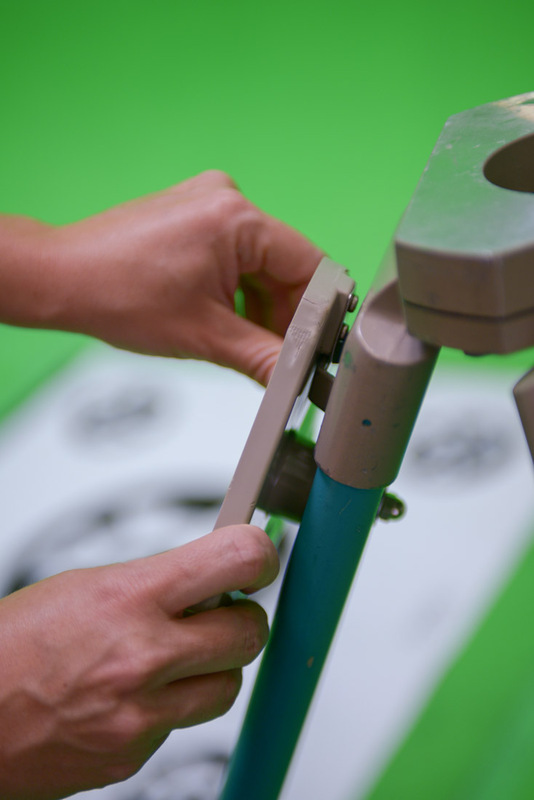 With both pan knob and tilt knob locked, use the tangent rings to do fine adjustments to pan and tilt. 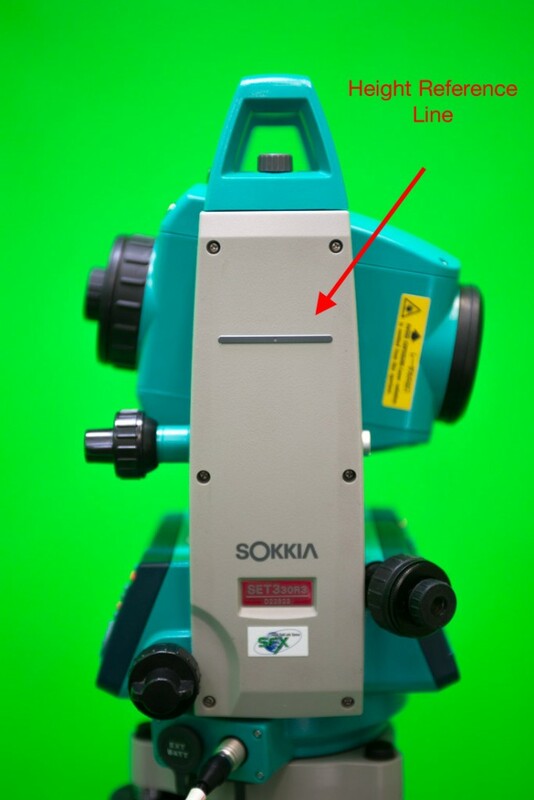 From the instrument’s eye piece, you should be both seeing the alignment cross as well as the point in focus. 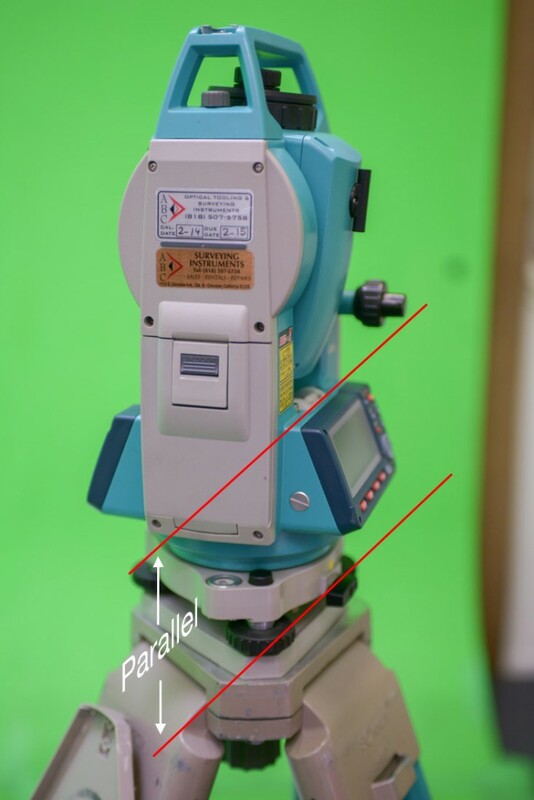 This is how you know the point is properly measured.The laser alone can sometimes be too wide when compared to the eyepiece’s bullseye. Make sure that you are measuring the point standing in the Master Side of the survey gun. 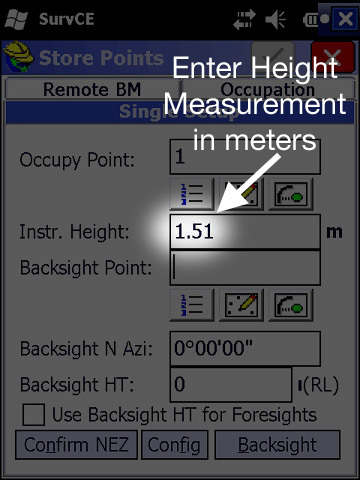 Now that the instrument is accurately pointing to our reference Backsight Point, we need to tell the data collector to trigger a measurement and store it. Back where we left off in the Single Setup screen, press Backsight in the lower right corner of the screen. 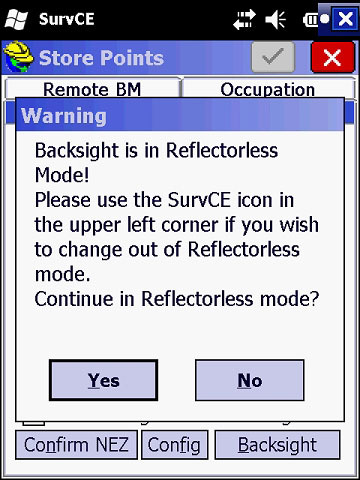 A dialog window will prompt if we want to Continue in Reflectorless mode. Press Yes, to continue. 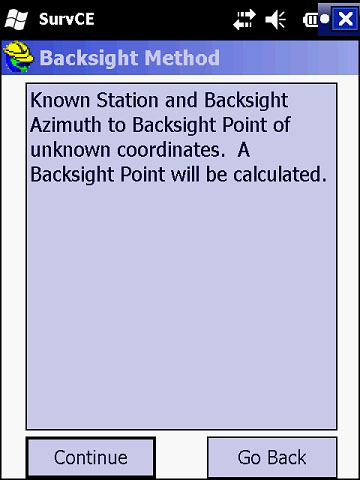 Next, we are prompted to either enter point coordinates or use a backsight Azimuth. 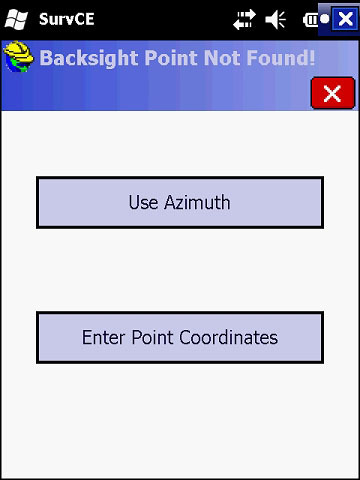 Press Use Azimuth to continue. 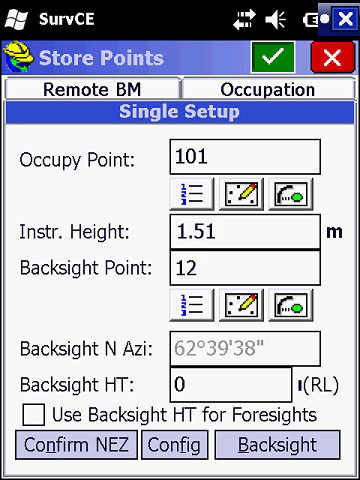 Next, we are prompted to either go back or continue to measure our backsight point. Press Continue to enter the Backsight set angle window. In the Backsight set angle window, at the bottom of the page, press Set Angle and Read. Note that the green check mark is grayed out. This will trigger the survey gun to click and make the laser blink. The check mark is now green. Press the green check mark to confirm. This opens a dialog window prompting the Description of the Backsight Point. 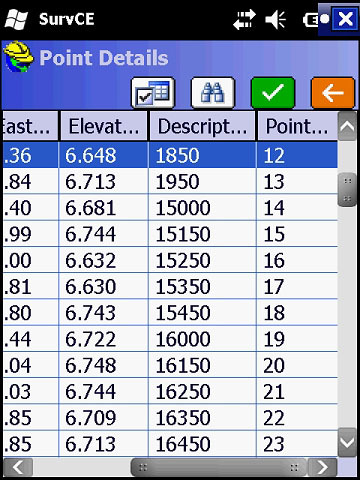 As determined earlier, the Point ID must be a number. It should automatically be set to 2. 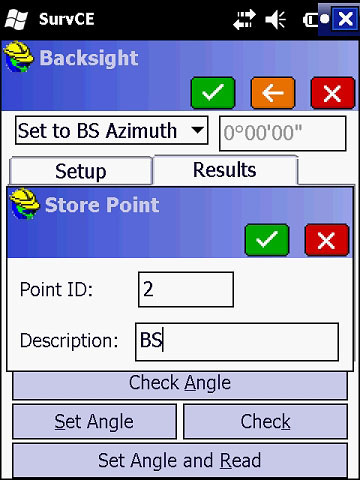 For the Description, use BP or BS for backsight point. This takes us to the main Store Points window. With the survey gun properly setup, we can start measuring points. 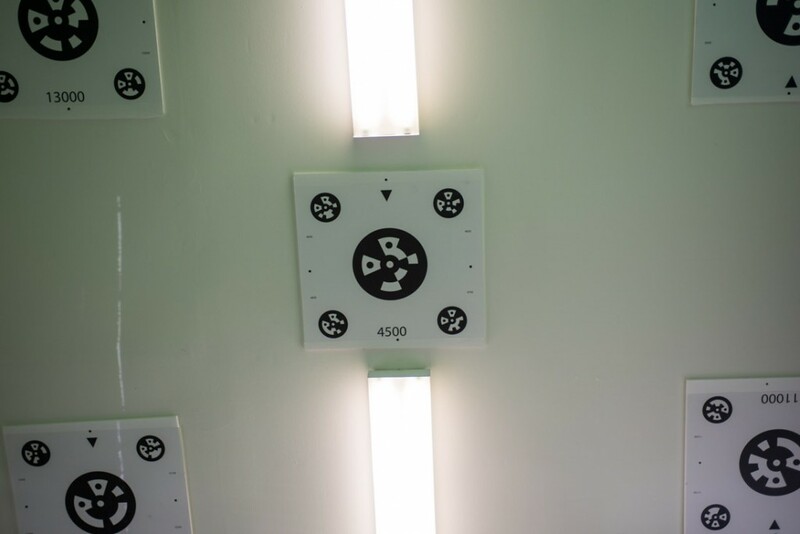 Pick a fiducial board to start surveying. 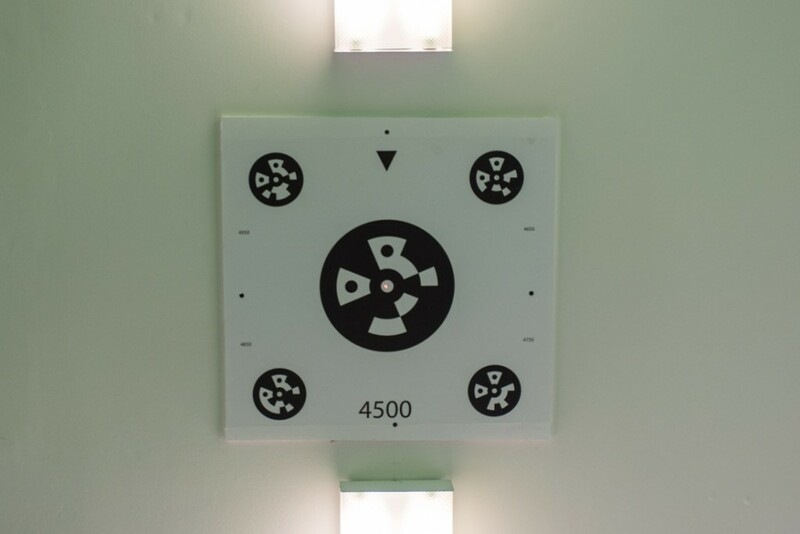 In the example below, we will survey the center board, starting with the fiducial marker numbered 4500. 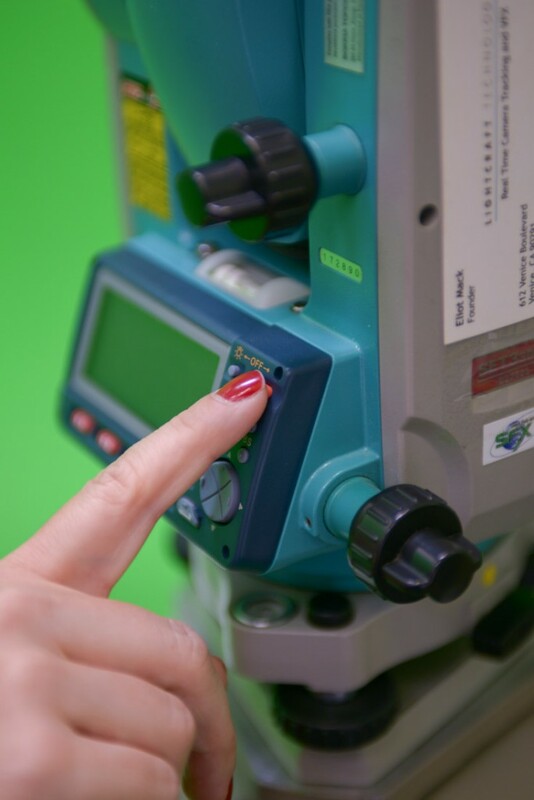 Turn the reference laser on by holding down the “Light” button until you hear the instrument click and the laser is on. WARNING: Direct laser radiation can cause vision damage. Avoid direct eye exposure. Do not stare into the beam. 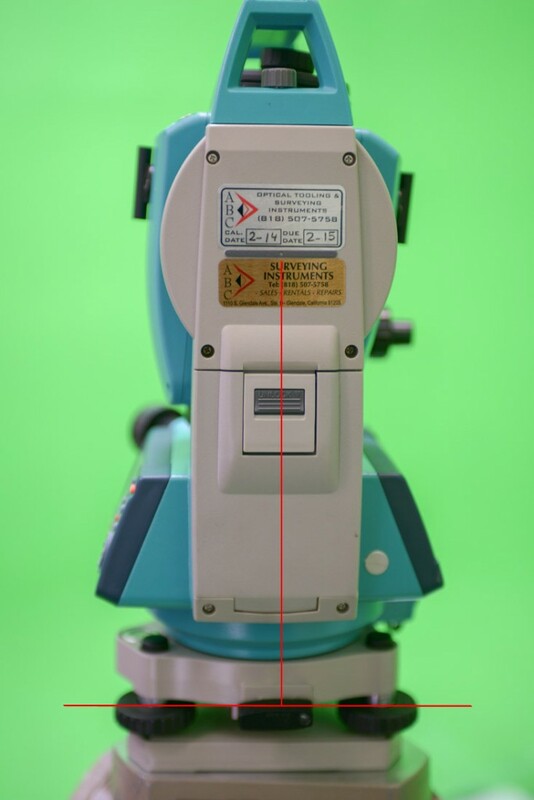 Point the instrument to the center of the marker using the reference laser. 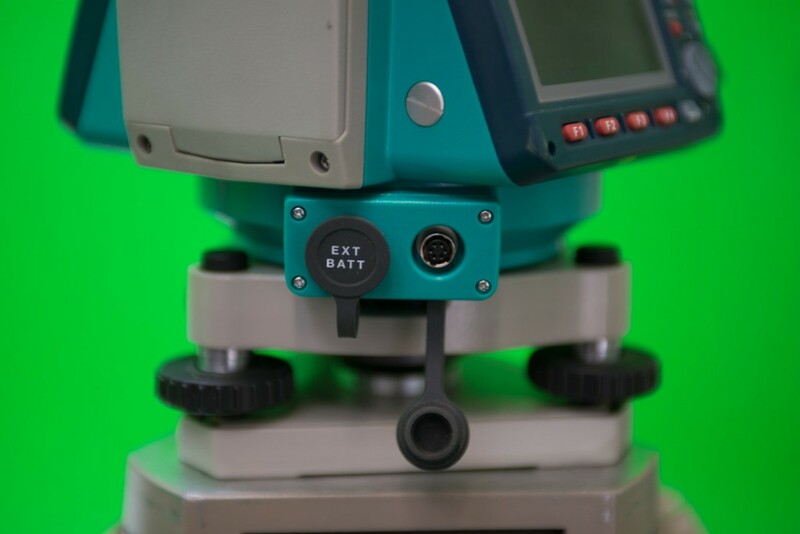 When the reference laser being close to the center of the fiducial marker, lock the tilt and pan knobs. To lock the tilt knob, turn the butterfly lock clockwise by 90 degrees to make it vertical. For each point, you will need to know how to FOCUS THE INSTRUMENT. 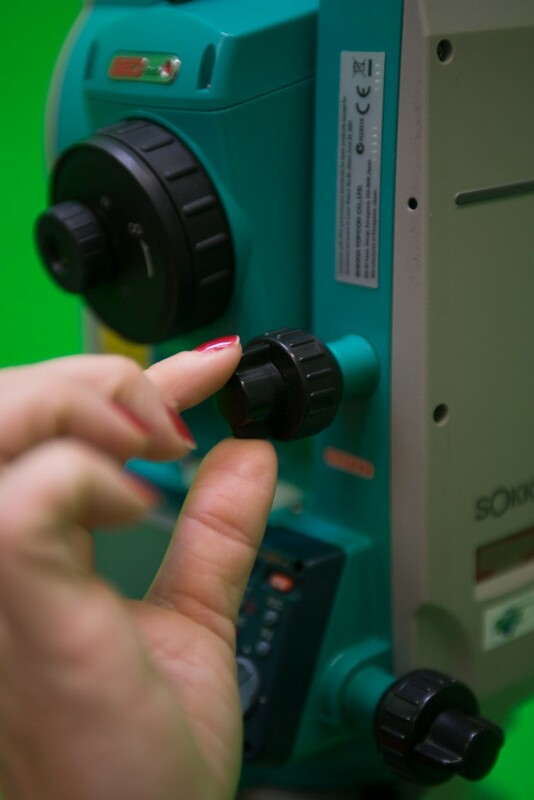 There are two focus rings: diopter ring (smaller) and focus ring (larger). 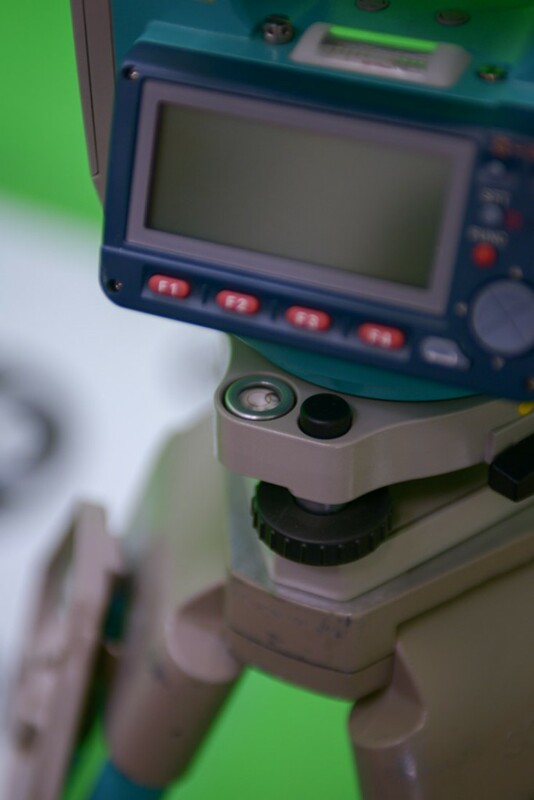 When the ground glass cross pattern is blurry, adjust the diopter ring. 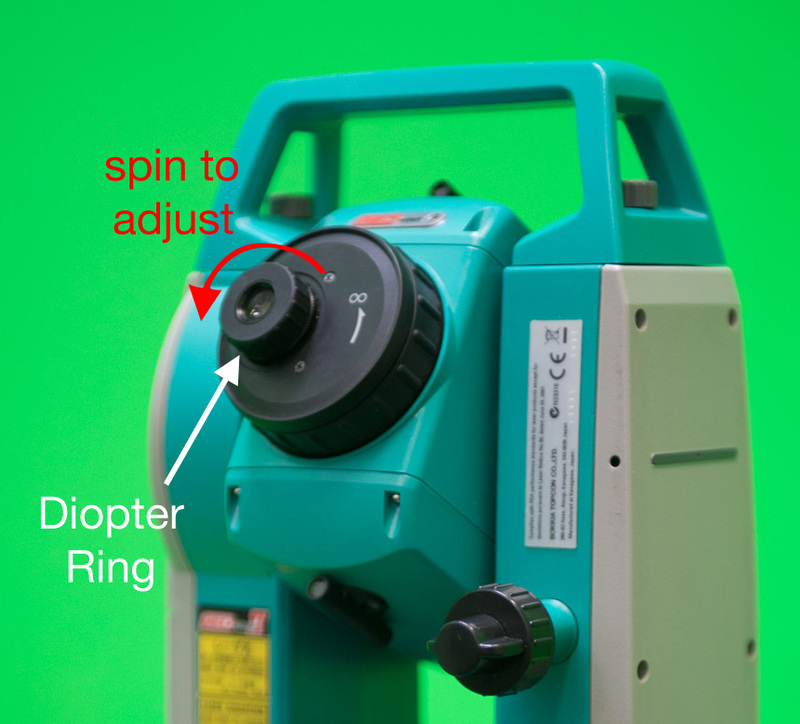 Always start with the diopter ring and move on to the focus ring after. 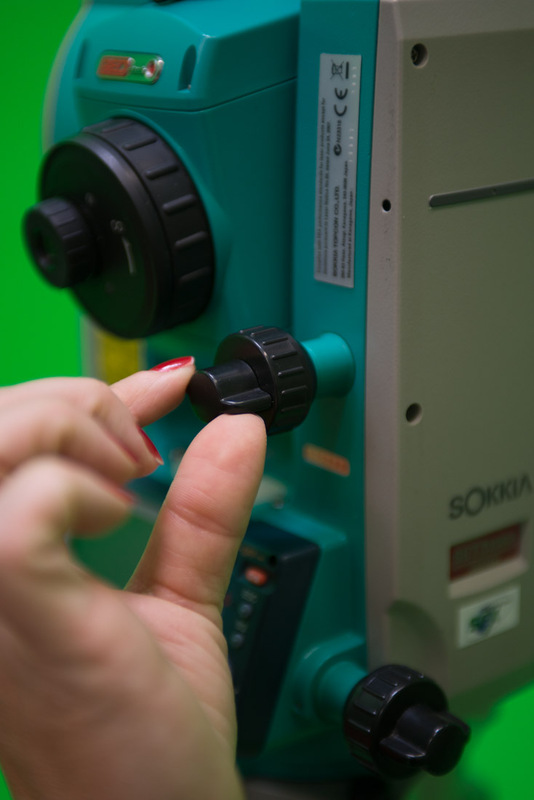 The eyepiece itself has a ring for diopter compensation. If you wear corrective lenses, to survey without your glasses, you may use this ring to focus the image. 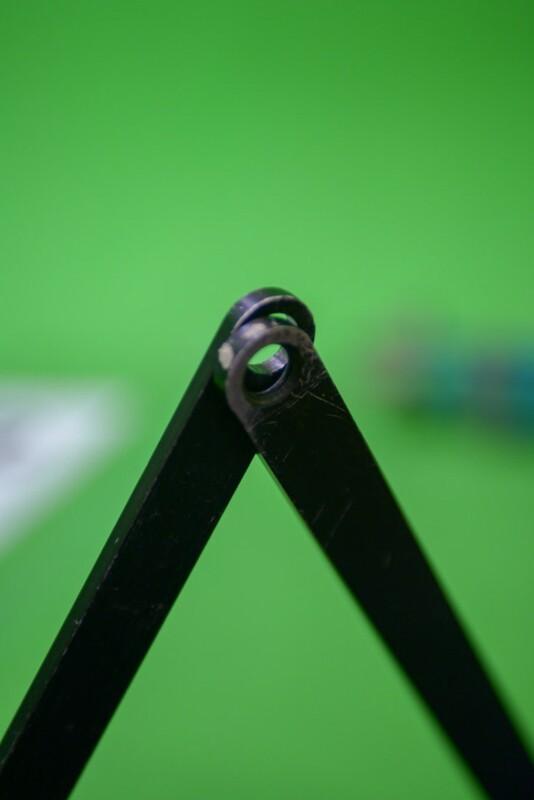 Use the diopter ring to adjust focus only looking at the ground glass cross pattern. 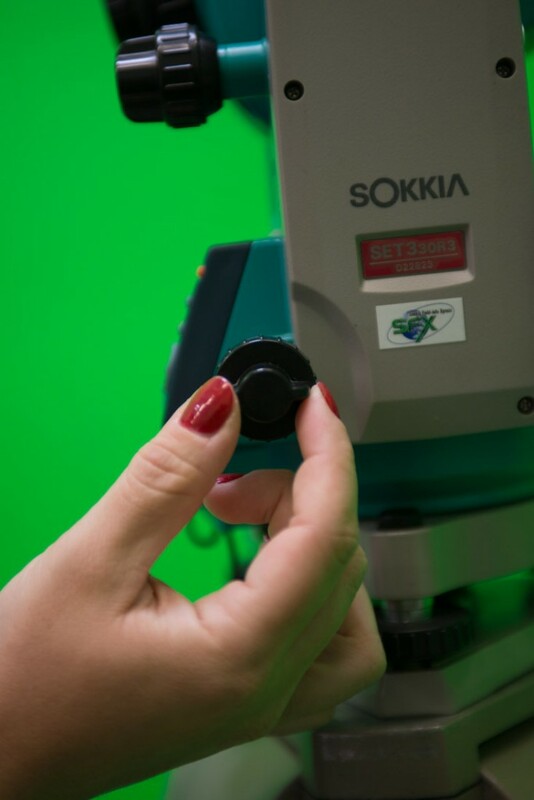 The larger cylindrical black portion of the eyepiece is actually a focus ring. 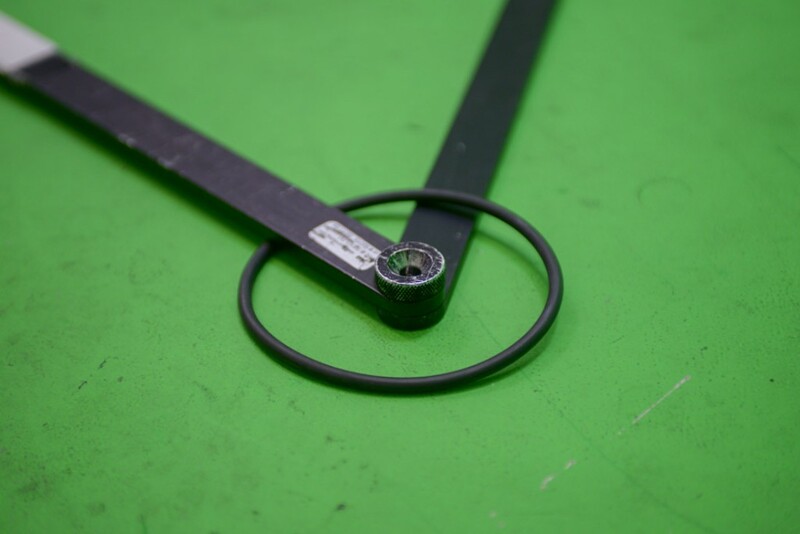 Use this only after adjusting the diopter ring first. 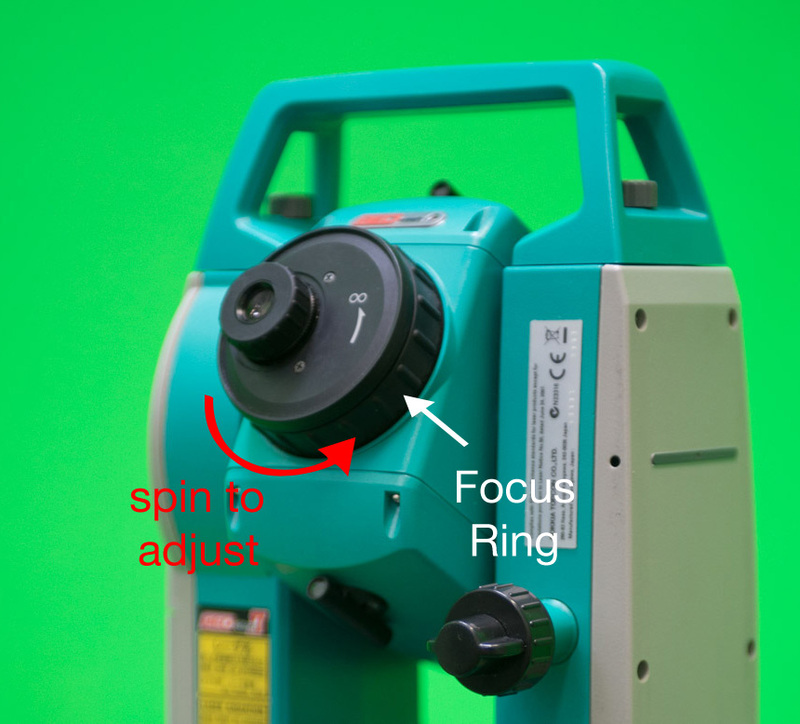 Use the focus ring to adjust focus looking at the actual image. 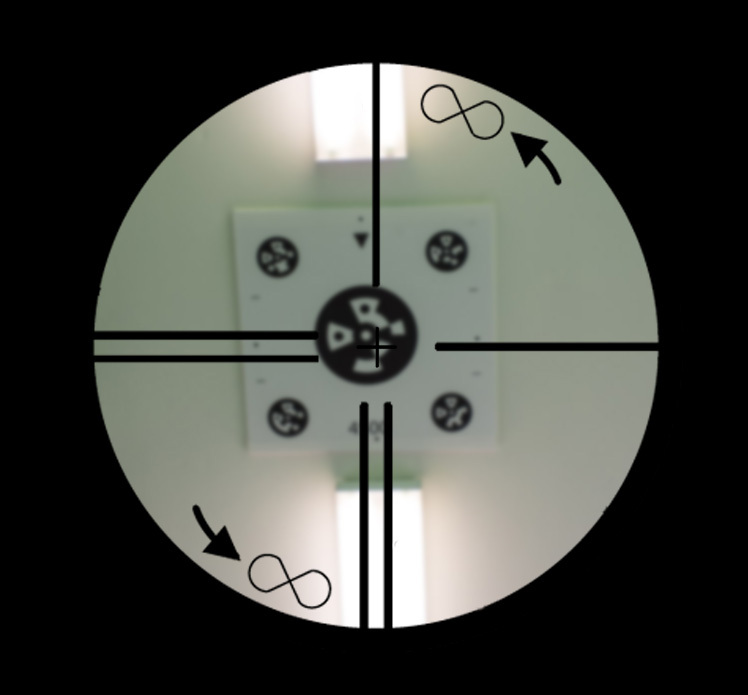 Using the pan tangent ring to move the ring until the image is aligned in the pan axis. Do the same for the tilt tangent ring. 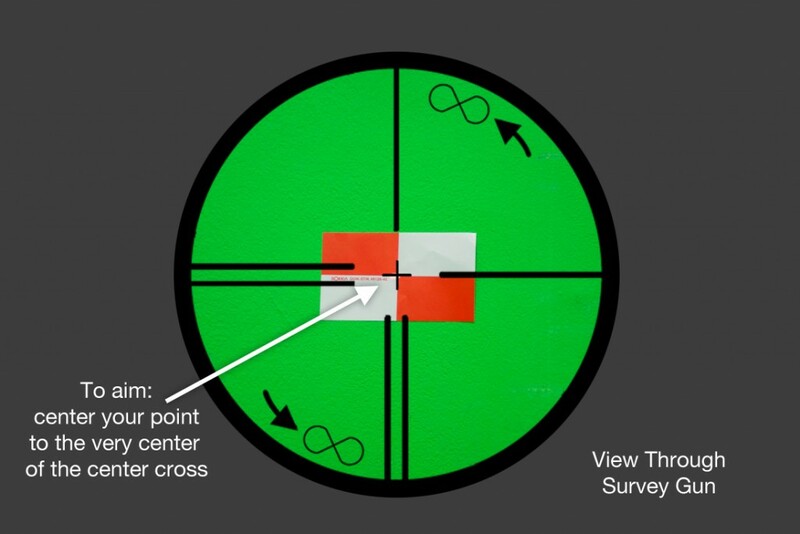 Move this ring until the center cross hair is aligned with the desired target. The target is now ready to be measured. Back in the data collector, we will use the target number, in this case 4500 as the Description. Input the description as numbers only. In this case, the board being measured is number 4500. 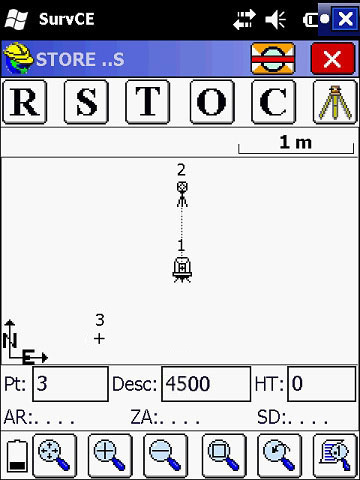 There are a series of buttons on the top row of the screen: “R” for “read point”, “S” for “store point”, “T” for “traverse”, “O” for “offset, etc. 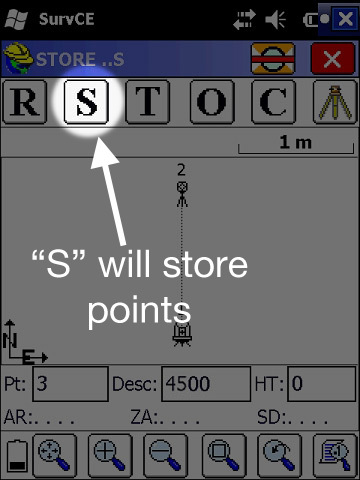 Press “S” to read and store point. You will then receive a confirmation of the current reading. This screen is very valuable. 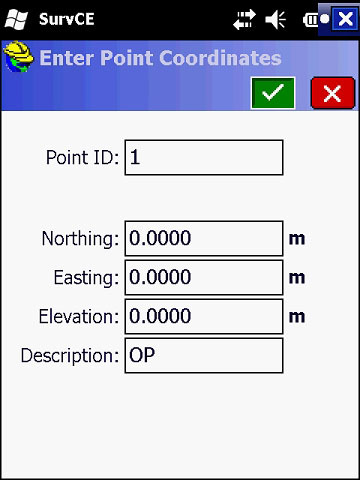 Pt ID – This field is automatically entered and shows the current point ID. 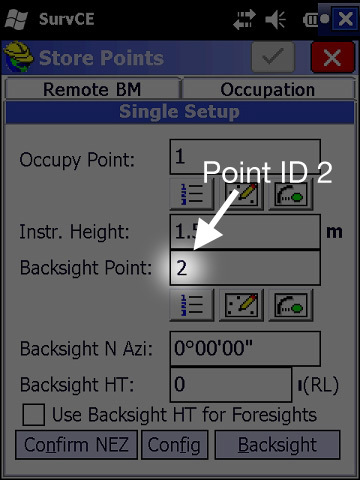 Point ID 1 is our current Occupy Point, Point ID 2 is the Backsight Point, which makes the next incrementally available point, ID number 3. HT – should always be set to zero. This will automatically be set to 0. N: – is the “Northing” measurement, in meters. E: – is the “Easting” measurement, in meters. 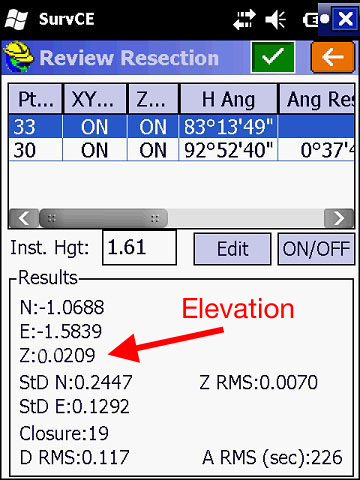 Z: – is the “Elevation” measurement, in meters. 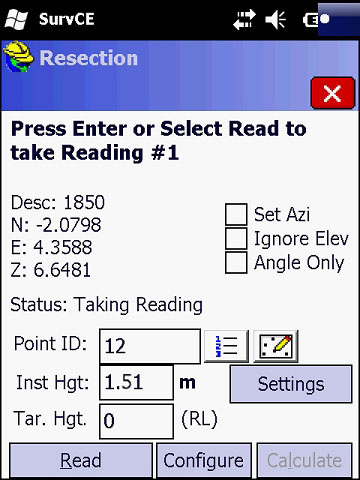 Desc – this is the description of the point and as set in the previous screen, it should be the number of the fiducial circle being measured. If all the numbers appear correct, confirm by pressing the Green Check mark. 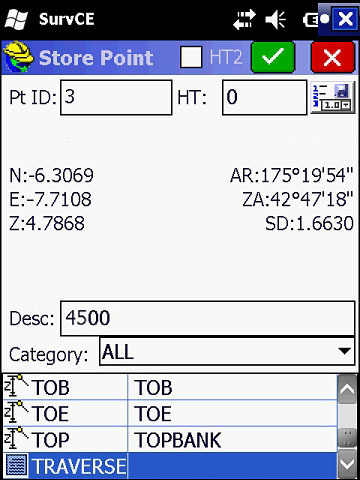 The new point will show in the main store points window like an overhead diagram. As more points are measured, you will notice points being grouped in groups of 5, like they are on the fiducial marker boards. Continue adding points until your boards are all measured. 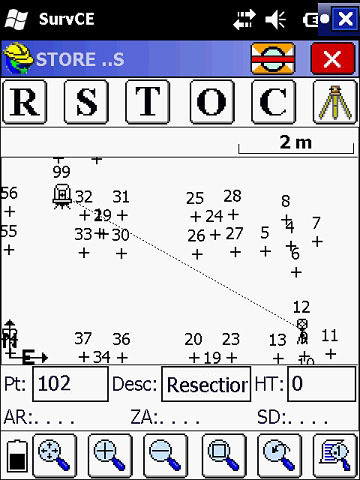 Should you run into points that are occluded or out of sight, move the total station to another position using Resection below. 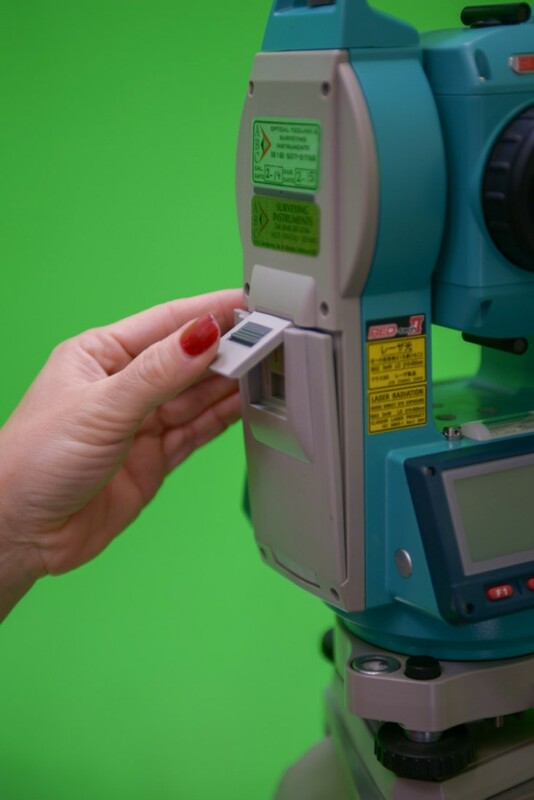 Often times, when surveying a stage you may need to move to another location either because not all points were visible from the first location or because you needed to move out of someone’s way. For this and other uses, you may Resection back into a survey. This function makes use of 2 or 3 known points that you re-measure from this new location. 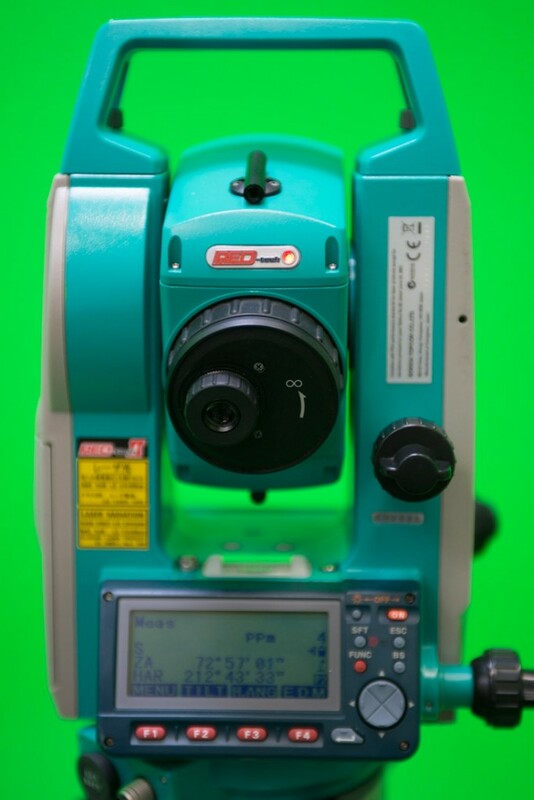 This will calculate where the total station is and place it in the same coordinate space. Once this new occupy point is calculated, you may continue adding points to the survey. In the Survey tab, select Resection. 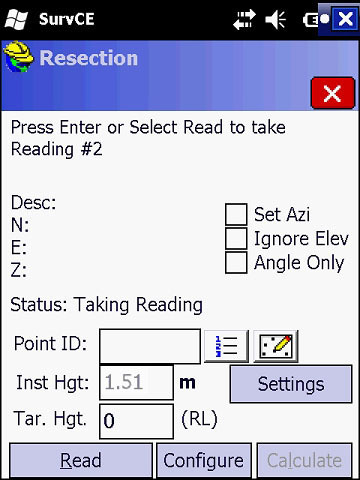 This opens the Resection window. 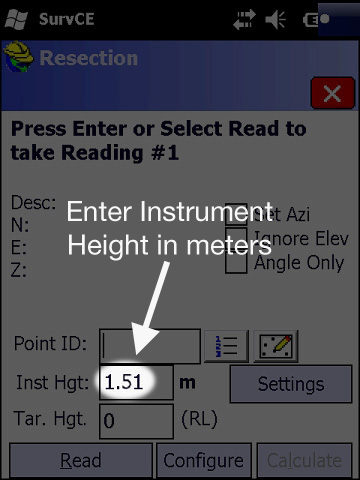 Start with – and this is VERY IMPORTANT – entering the proper instrument height in meters. Just like before, this is measured from the floor to the horizontal reference line. 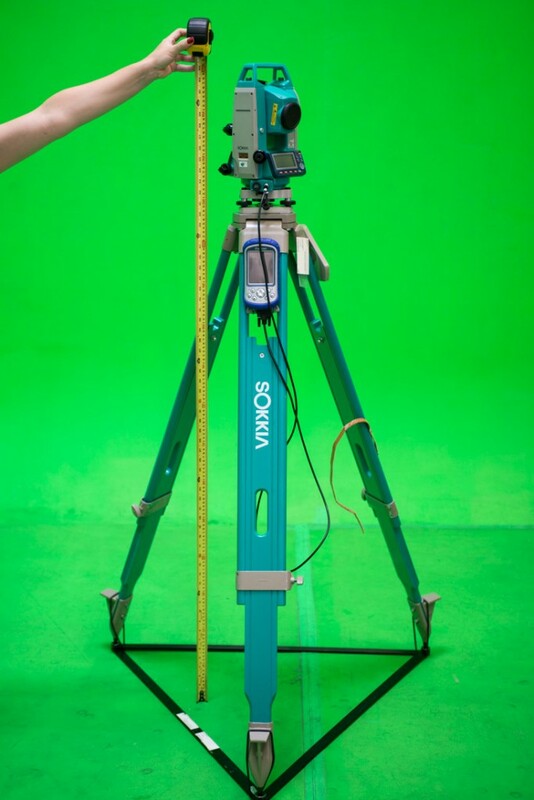 In the example shown, the instrument height is 151 centimeters, which is 1.51 meters. Next, tap on the point list button to view all the points in the survey. This opens a list, like a spreadsheet, with all the points in the survey. The first few columns don’t show the target Description. Scroll to the right to reveal the column. 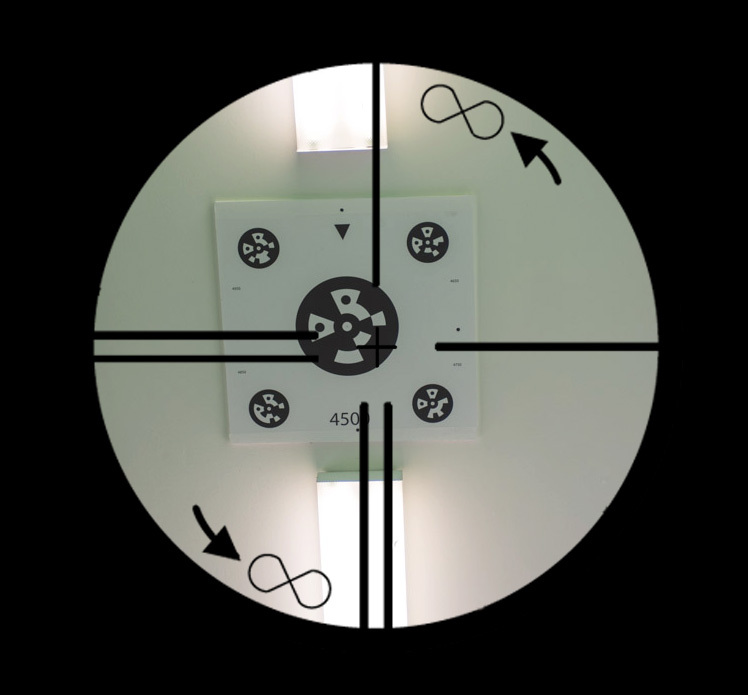 The Resection reference points can be any one of the 5 fiducial circles on a board. In this example we are using point 1850. Tap on the correct row and commit with the Green Check mark. 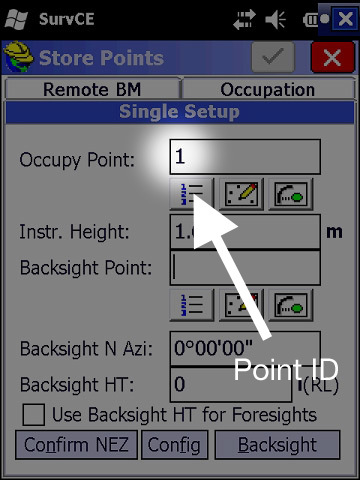 Back in the Resection window, the Point ID field will have the number of the Point selected. 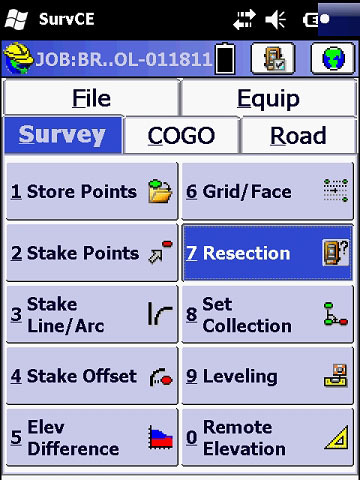 Point the survey tool to the selected point. In this example, our Point ID 12 is fiducial number 1850. 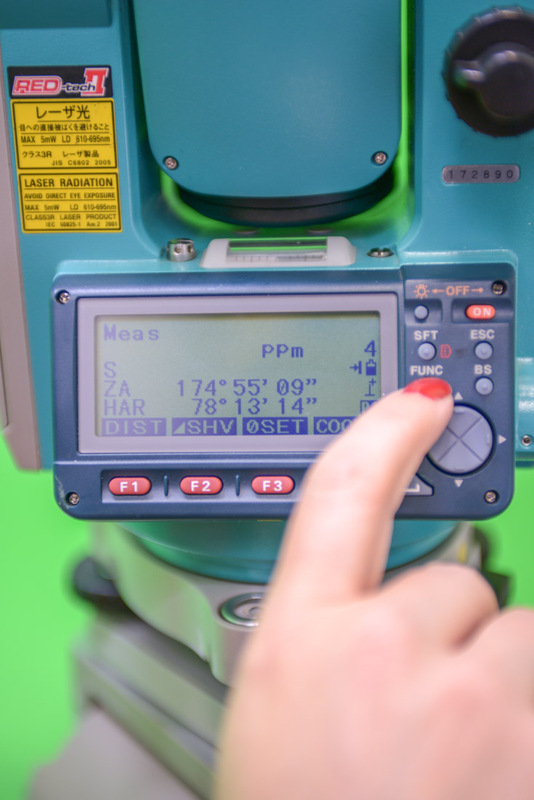 When the survey instrument is properly aiming at the center of the reference marker, press READ to trigger the survey gun to shoot. 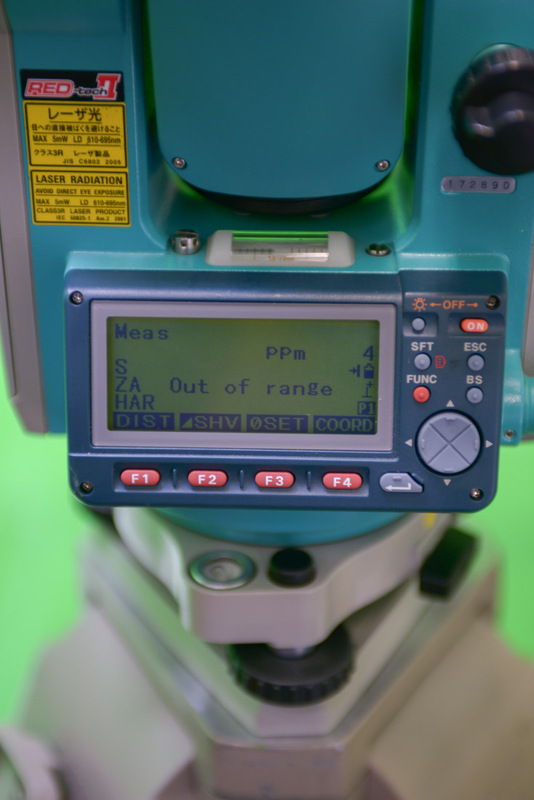 This will trigger the survey gun to click and measure the point. 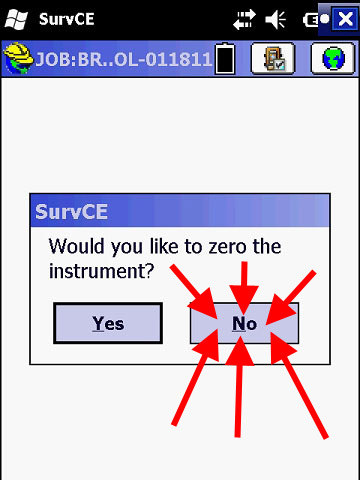 In the data collector, and this is VERY IMPORTANT, there will be a dialog window asking: Would you like to zero the instrument? Select NO!!! The next window will have your reading results for this first reference point. Leave Target Height at zero. We will need to do this again for a second and a third point. 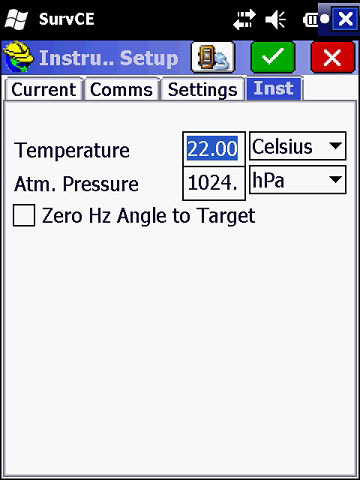 After the second point, the Calculate button will be enabled. After the third point is measured, press Calculate. This will open Review Resection window. 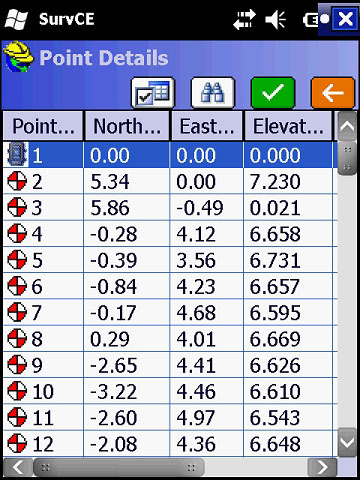 Check elevation (Z:), which should be zero or close to zero, unless you are at a stage where there are multiple levels or stairs where the total station is setup. Next, we save the current resectioned location as a new point. In the Description, save it as RS1 or Resection. In the Survey tab, select Store Points. The fields for Occupy Point, Instr. 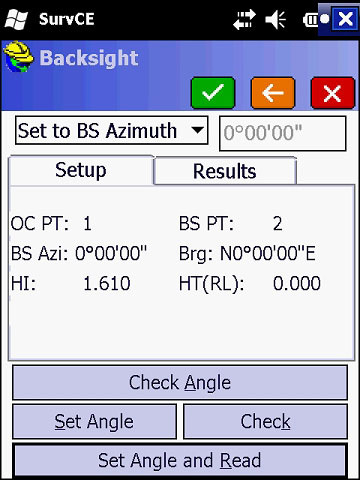 Height (Instrument Height) and Backsight Point are all set according to the Resection process. 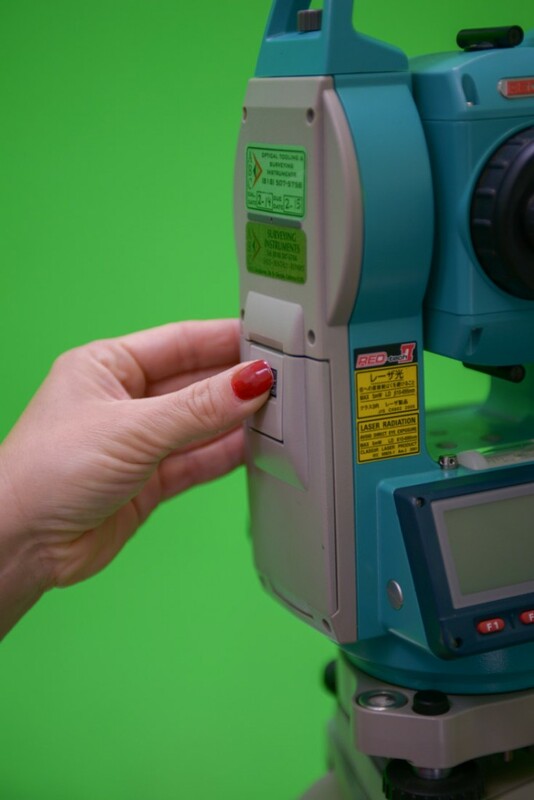 Instead of measuring another backsight point, confirm by pressing the green check mark. You are now ready to add more points to the survey. 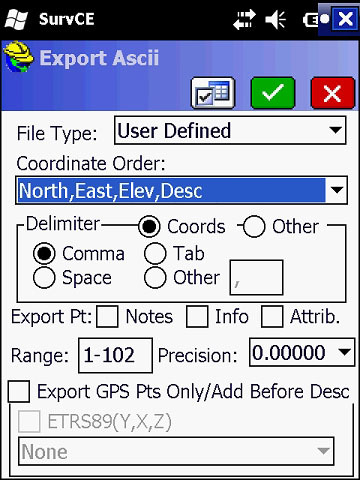 To export the survey to use in Constellation Tool, use the Export Function. In the File tab, select Import/Export. Then select Export Ascii File. 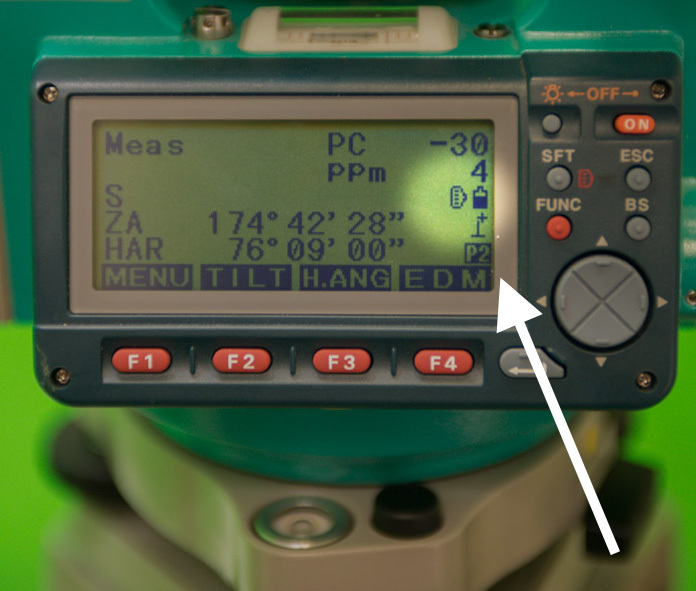 If your screen ever reads Out of range, this means that the instrument is not leveled. See above for Leveling Total Station instructions.